If you would like to discuss the possibility of my writing a review, an endorsement, blog posts, publishing photos & videos, providing social media exposure, etc., for your attraction, activity, or service, please submit the form on the CONTACT page. I look forward to working with you! I’m not able to do much consistent volunteering given all the travels I do. But the one thing I try to make sure I do each Spring & Fall is to volunteer at the Friends of the Public Library book sales here in Boise! The deals are amazing on great books, records, posters, etc., and it’s fun to see some of the same people come in for each sale. The library staff and volunteers are super people, and the sales raise a large sum that goes to further the growth of the libraries around the city! 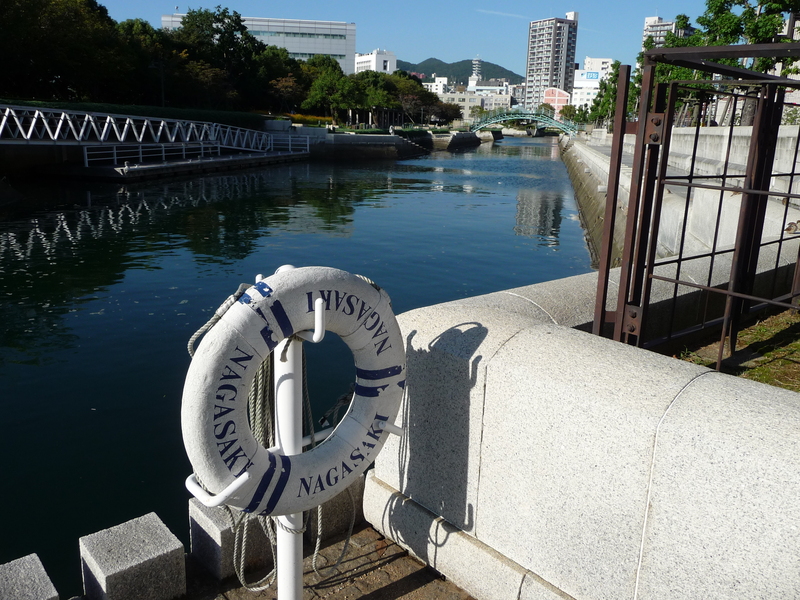 I’ve been to Nagasaki many times on cruise ships, but this was my first trip to Hiroshima. 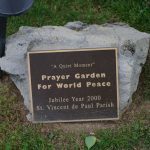 Going to the Peace Memorial Park was a great experience to see so many school children there on field trips, and to read the stories behind the markers, plaques, buildings, memorials, etc. 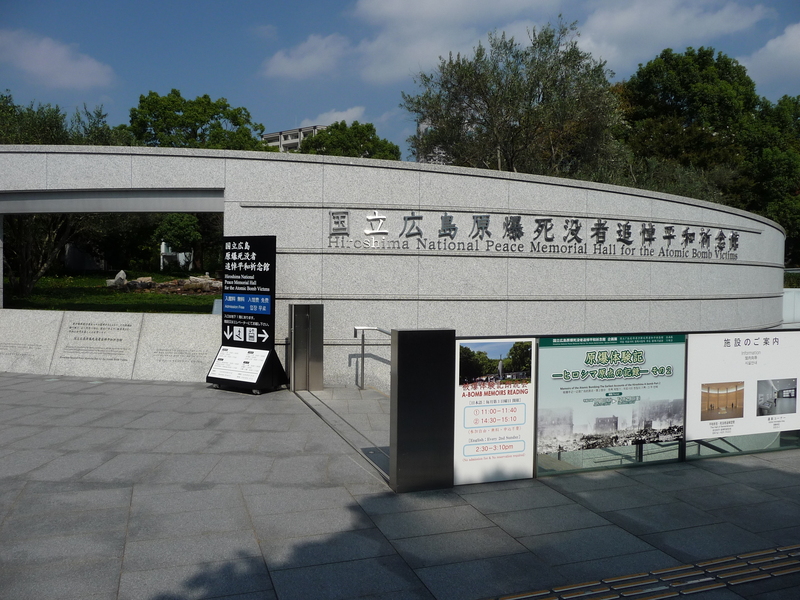 The Atomic Bomb Dome was previously the Prefecture’s Promotion Hall (Tourism Bureau). 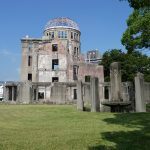 When the Atomic Bomb exploded about 500 feet away at an altitude of about 2,000 feet on August 6, 1945, the explosion was almost directly overhead, which allowed the building to stay mostly intact. All the occupants inside, however, were killed immediately. The building was registered in 1996 as a UNESCO World Heritage Site. Here is a reminder that war is Hell, and that peace is good. 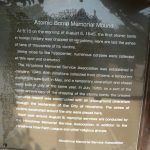 The signs actually call this the Atomic Bomb Memorial Mound, the place where cremated remains from the bombing were laid to rest. 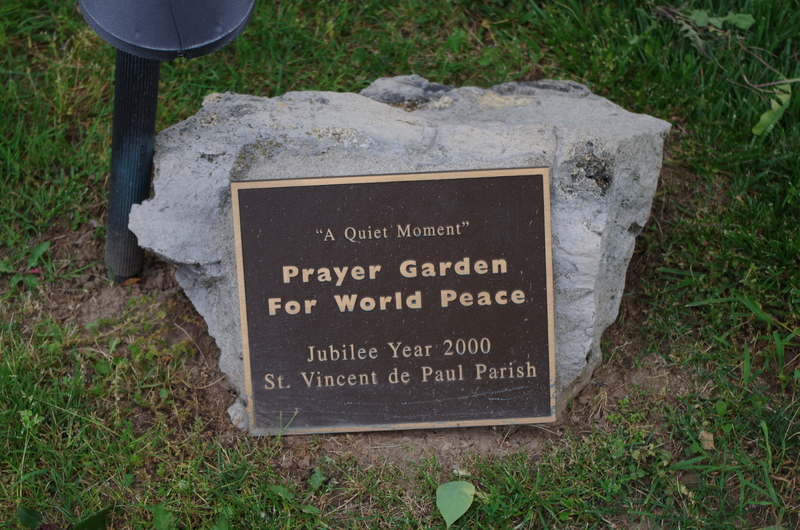 You will often see people chanting and praying here for the dead. 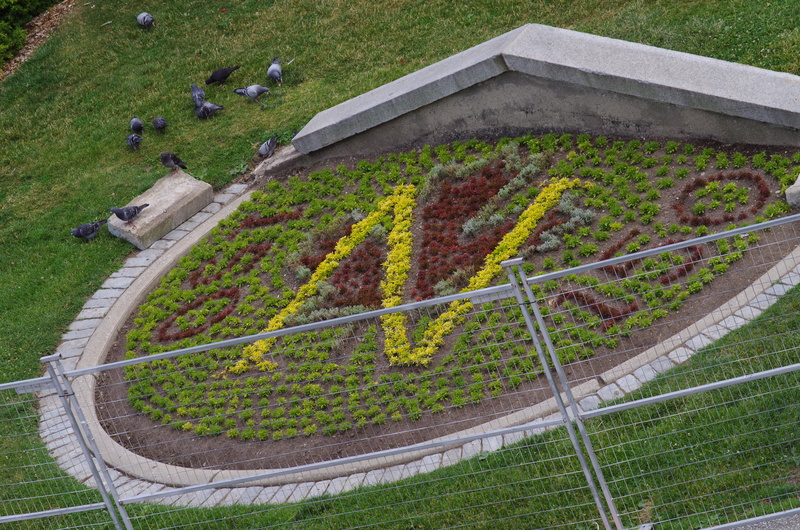 It’s not in the most conspicuous place, but it’s near the Peace Bell. 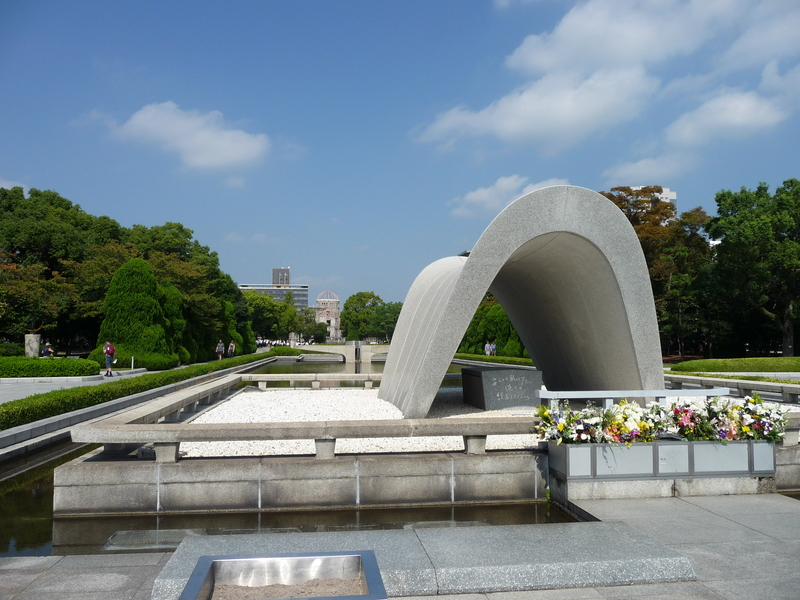 They hold a memorial service here every year and people bring paper cranes and other signs representing peace. 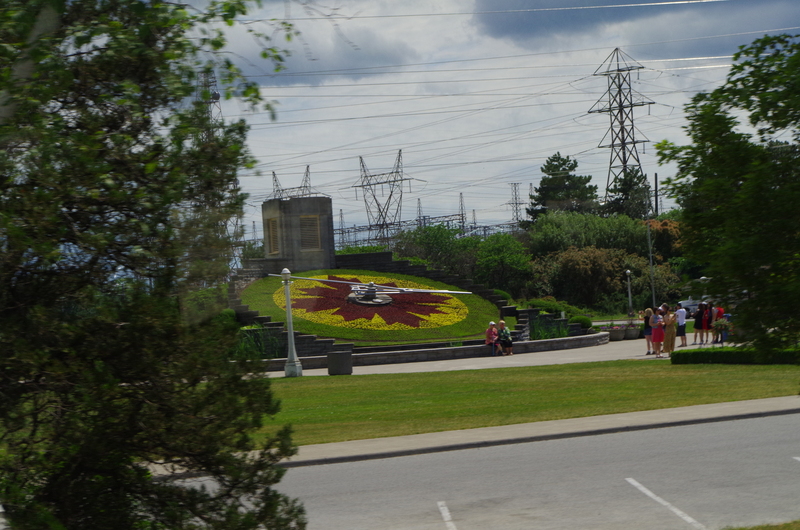 The Peace Clock Tower is at the far end of the Peace Memorial Park. 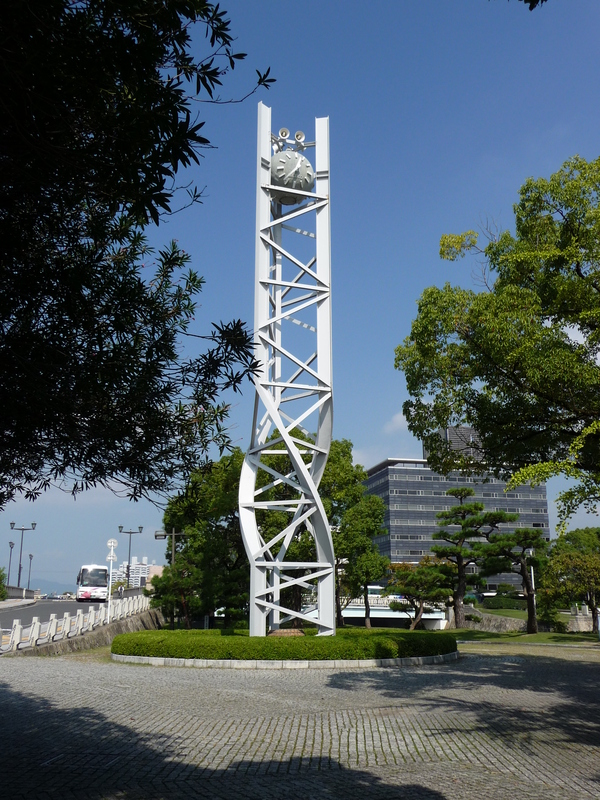 Every morning the clock rings bells at 8:15, the time of the first atomic bomb’s explosion on August 6, 1945. The twisting nature of the skeleton is reminiscent of the twisted steel structures that resulted from the bomb. When you get close, you see that the clock is a Seiko-brand watch. 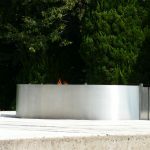 The Peace Flame in the Peace Memorial Park is in the middle of an artistically designed structure that sits in a reflecting pool. The pool runs parallel to the neighboring river and it extends from the Cenotaph near the Peace Memorial Hall. 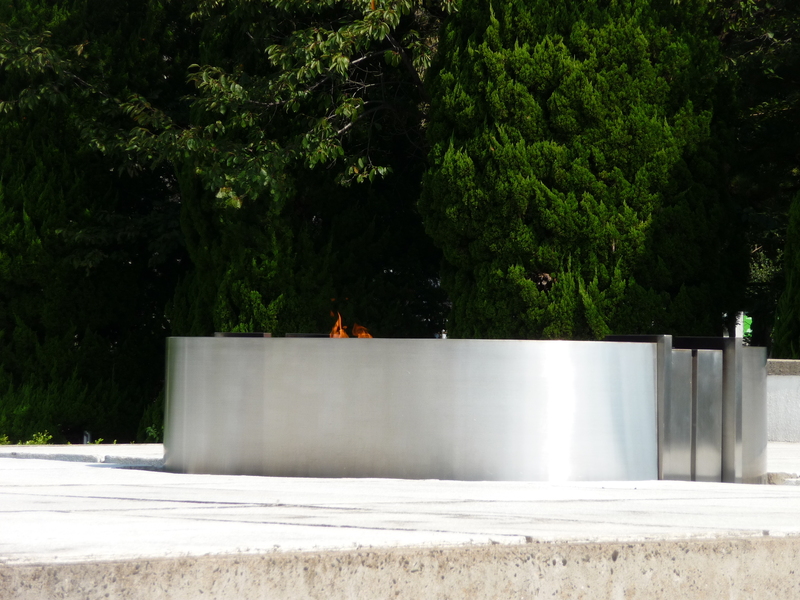 The flame is not very high, so it’s not the most visible especially on a bright sunny day. 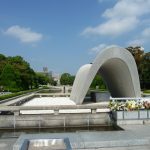 As you walk around the expansive Peace Memorial Park in Hiroshima, you won’t need a sign to tell you where the Peace Bell is. 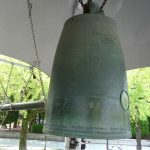 At least two people from every tour group go up the steps and ring the bell. I was by myself, and I rang it! It is a beautiful sound, and the thought of its being the sound of peace is comforting. Walking down the ramp inside this Memorial Hall isn’t enough to prepare you for the devastation that you see from the photographs after the bombing. 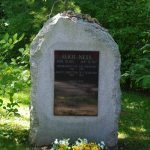 You can look up victims by name if you are a relative or know of someone who was killed by the bomb. The visitors inside were respectful and quiet while walking around. The 360 degree panoramic view of the area gives you quite the perspective of the damage. as you leave, you walk up the stairs next to a rippling waterfall that is calm and peaceful. There is no admission charge to walk through the hall. View my brief YouTube video of the waterfall that’s just outside the Memorial Hall. 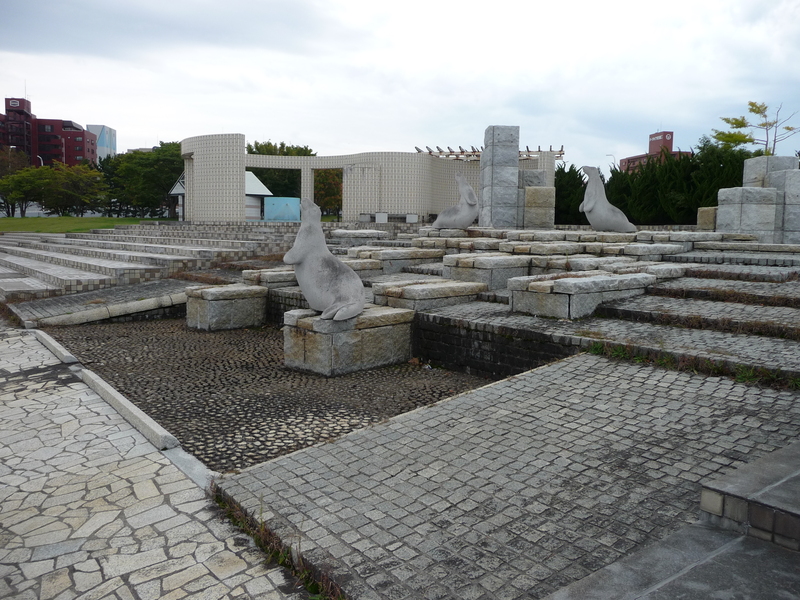 The Children’s Peace Monument is the first exhibit you see when you cross the bridge from the A-Bomb Dome area. 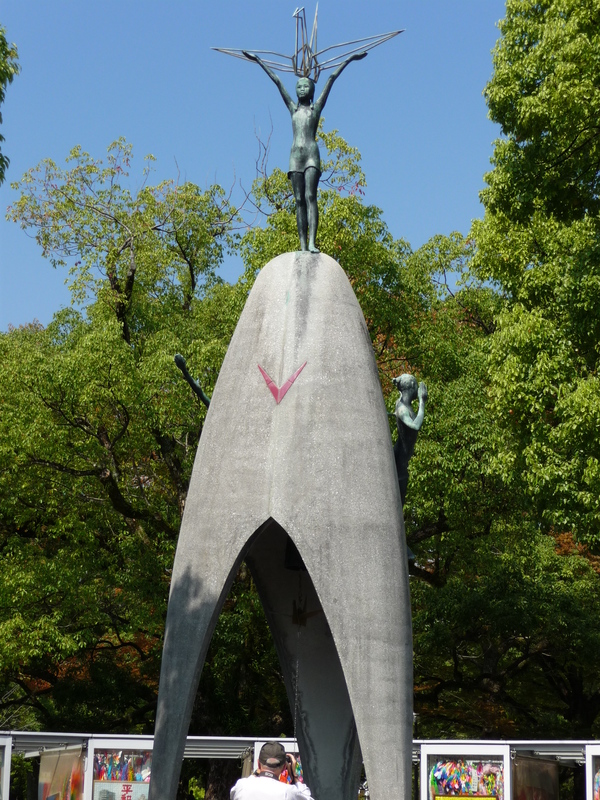 The crane on top of the young child at the top represents the desire for peace as well as a recognition and memorial to the children lost in the bombing. It’s heartwarming to see so many school children listening to the stories (and so well behaved and mannered!). 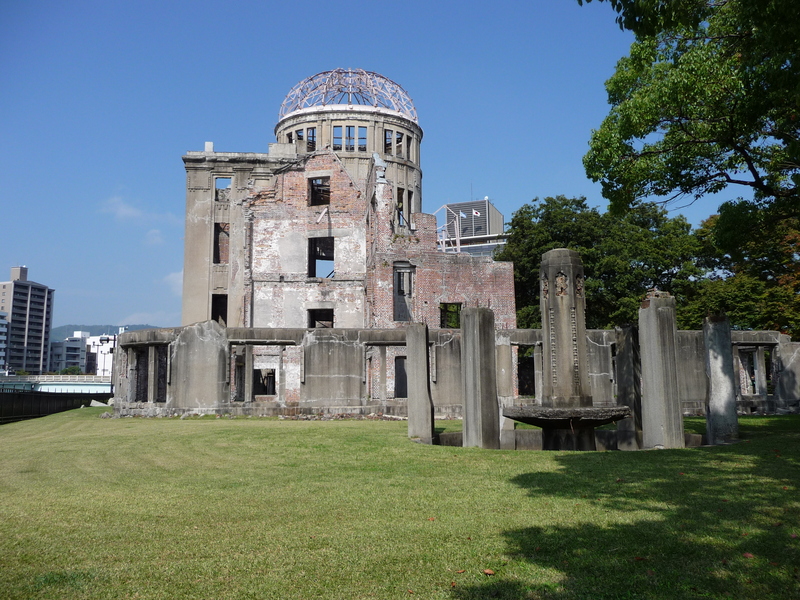 I’ve been to the Peace Park in Nagasaki, Japan, many times, but this was the first time I’d been in Hiroshima. 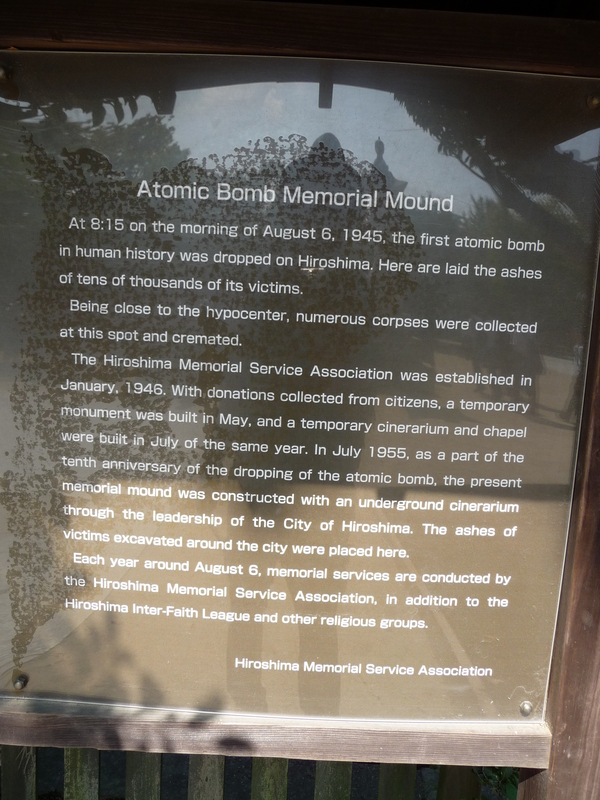 After a bus ride to the train station, I took a 25-minute ride to the Peace Memorial Park area (the stop is labeled for the A-Bomb Dome), and then spent several hours walking around, reading signs and looking at many of the exhibits. I enjoyed seeing many groups of school children being led around the park. There was one place I was looking at, and I heard a female Japanese tour guide explaining it to the couple she was guiding. She then took the time to come to me and explain it to me in perfect English.I was overcome by her amazing kindness. I was able to bow and say, “Arigato” to her — and that brought a smile to her face. 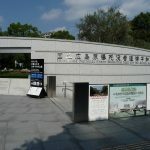 Visiting this Peace Memorial Park is an absolute must; there are so many things to see and stories to read. 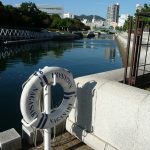 Most cruise ship passengers get off the ship and walk right through Aoiumi park into town without realizing what they’re missing. While this park isn’t the most beautiful Japanese park I’ve seen as I cruise around the area, it has a calming nature to it and it’s worth spending some time in it. 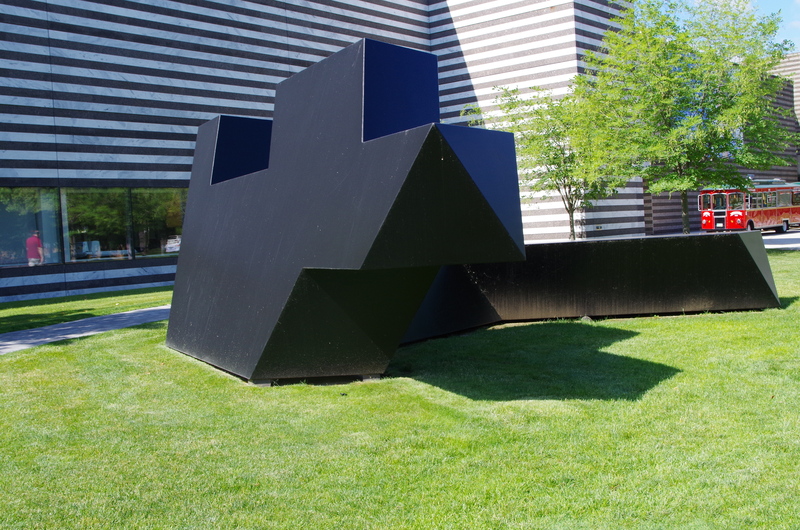 There are some sculptures, some water features, and some places to just sit and relax. You don’t need to spend a lot of time there, but you should slow down and enjoy it as you’re passing through. 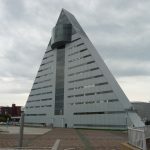 The tourist center at the port of Aomori is a distinctive triangular shaped building that is easily recognizable. While the exhibits inside are nice, and informative, I think it’s the shape and location of the building that make it more interesting. The bulging out windows near the apex add an additional artistic element to the building. 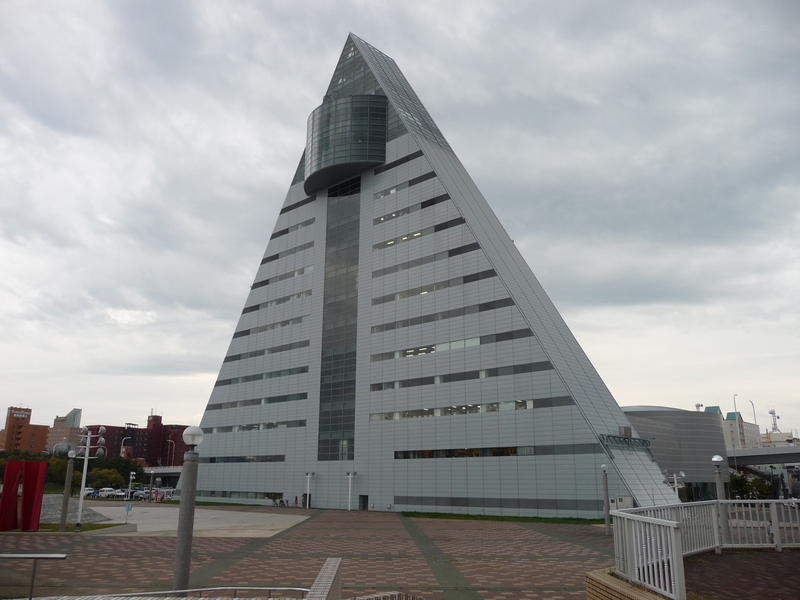 What I do find sad is that the small glass-shaped pyramid building out front isn’t being used for any function. That would be an ideal location for tourist booths, coupons, etc. 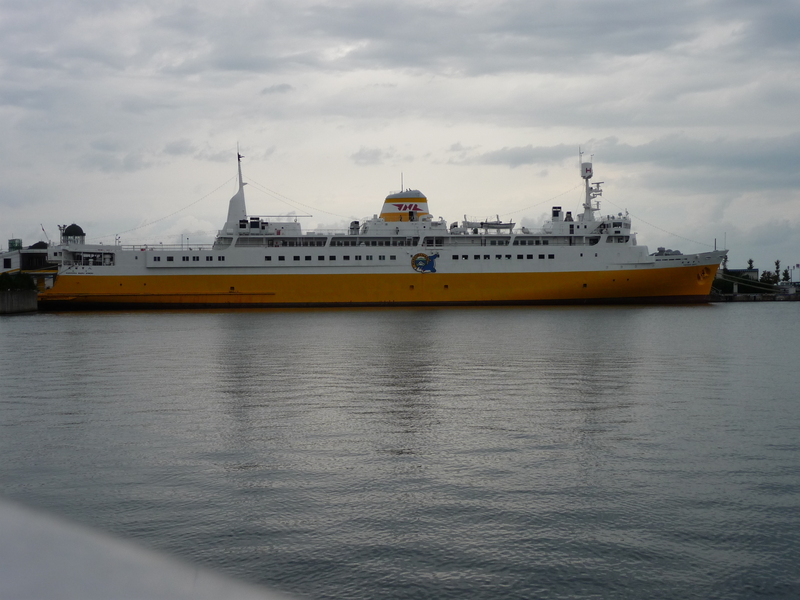 The ship Hakkodamaru (“maru” means “ship” in Japanese) is a memorial museum to the ferry service between Aomori and Hakodate that was so critical to transportation and commerce between the two cities. 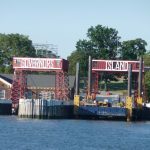 The new bridge and tunnel have made ferry service impractical today. There is so much history contained in here that you can spend at least a half-day looking around. A highlight is the train track that was used to carry train cars between the islands. 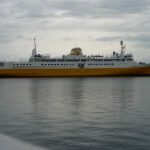 This ship is just a short walk from town or the port, so it’s worth a visit. 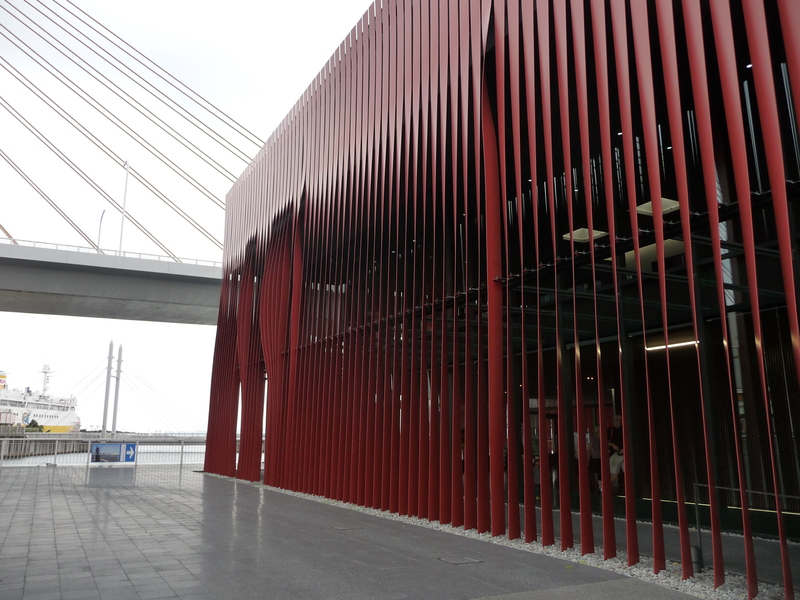 I’ve been inside the Nebuta Museum on previous visits to Aomori, so this time I was more interested in the exterior. The red vertical fins are designed to appear to be moving with the water or blowing in the wind. If you like design and art, I’d suggest a stroll around the exterior of the museum building and look at the various configurations of the fins. The free shuttle bus from the port took the cruise ship passengers to the Gukje Market where we had several hours on our own. This market stretches for blocks and blocks in all directions, and you can find anything you’d need here. There were many locals shopping here for shoes, umbrellas, clothing items, hardware items, wrapping paper, and, of course, food. I stopped at one stall and bought “something on a stick” that tasted nice. The lady tried to tell me what it was, but my lack of knowledge of the Korean language didn’t help. I smiled and mumbled out “Thank You” in Korean (I still have a problem with that one! ), and then walked on. 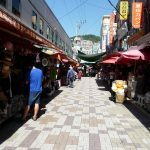 The location of this market makes it a nice starting and stopping point for shopping in Busan. 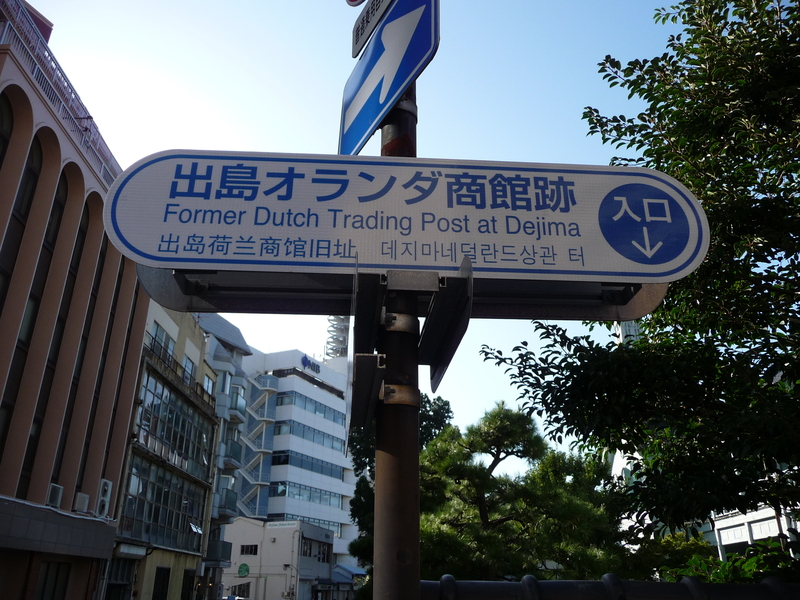 From here you can easily walk to the 13-story Lotte Department Store as well as to other markets. 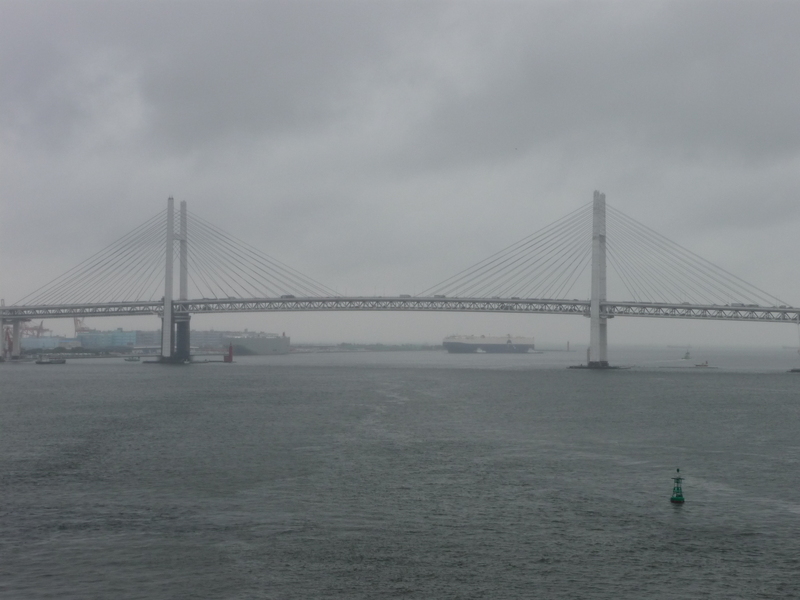 The new port in Busan where the larger cruise ships dock is a vast improvement over the previous port. Next to the docked ship is a small Customs and Immigration building that has a shopping area plus free Wi-Fi. 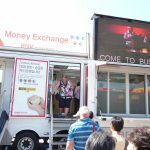 Each time we’ve been there, a “portable bank” has been set up in the parking lot for money exchange. 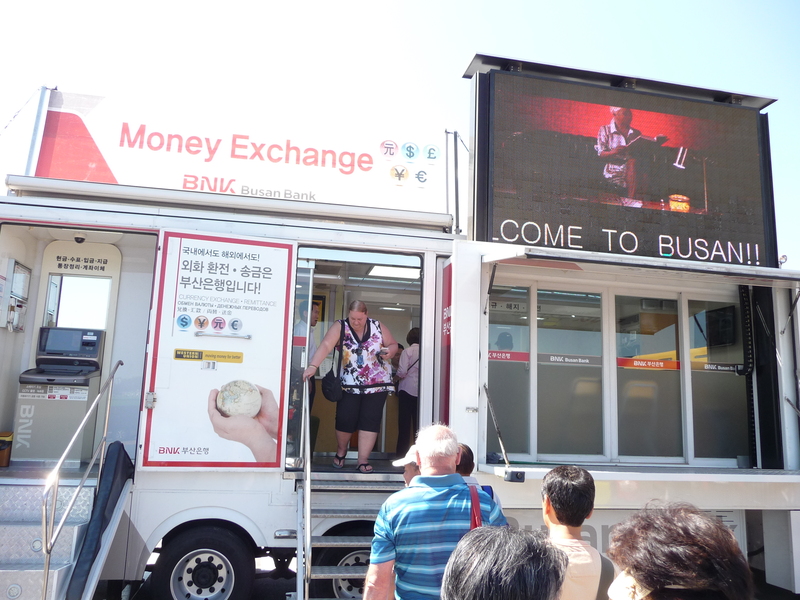 This is a great place to exchange all of your leftover currencies from other SE Asia countries into the Korean Won. Be careful, however, of people roaming the lot offering to exchange money from their wallet. I don’t have proof that it’s a scam, but why would they be there when an official bank is already there? 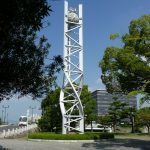 Most people just quickly pass by the Nagasaki Seaside Park as they’re speed walking to the the tram (as if the Peace Park won’t be there if they’re “late”). This park is a nice respite from the hustle of the day and from the cruise. There are many places to stop and sit and reflect on the beauty of the area and to be thankful for being able to travel. Stop here, even if it’s only for a few minutes — you’ll be glad you did! 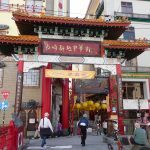 I’ve been to many Chinatowns all over the world. 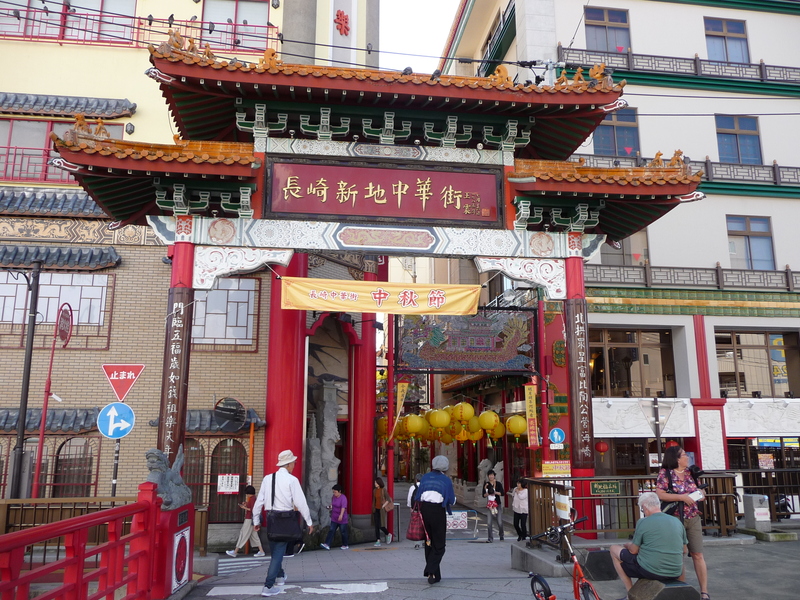 The Chinatown in Nagasaki isn’t very big, about three blocks square, but it’s VERY GOOD! There are many nice shops for all sorts of interesting and maybe even quirky items. The locals shop here also, so you know that the items are good and they’re priced fairly. 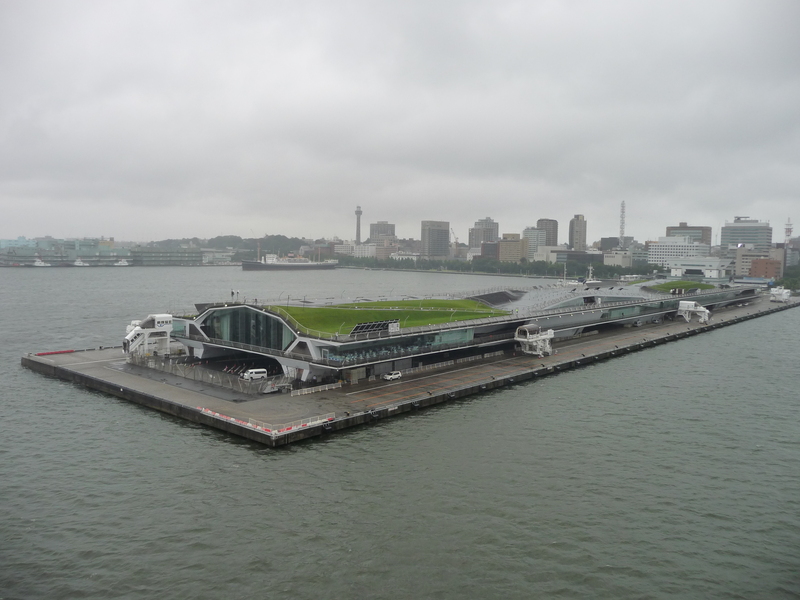 It’s an easy walk from the cruise ship terminal; you can even stay on flat ground if you don’t want to be climbing any hills (such as the Hollander/Dutch Slope). 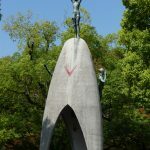 This should be on your MUST VISIT list the next time you go to Nagasaki! 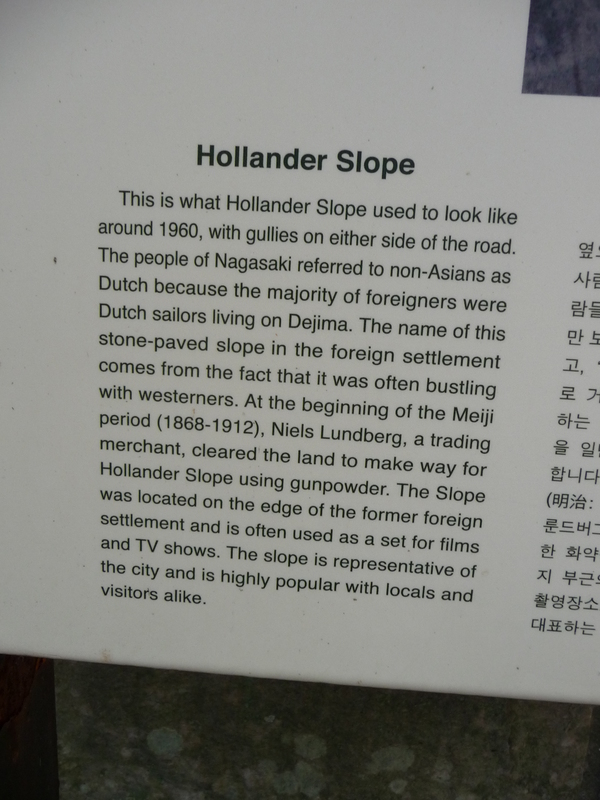 I’ve been to Nagasaki five times on cruise ships, and when I first read about Dejima, I thought it would be really interesting. When I went there this last time, however, I was quite disappointed as it’s mostly just a tourist trap that charges admission. A truly historical area would be free and would provide valuable information. Sorry, this place just doesn’t do that (although I did see some people going inside the area). 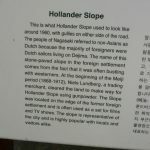 The history behind Dutch Slope (aka, Hollander Slope) is quite interesting. Many of the early Caucasian settlers were Dutch, and then it turns out that the locals would call ANY Caucasian Dutch because of the similar appearance. There are some old western style buildings that you can visit here, and there’s also a coffee shop where you can sit outside and enjoy the view. Once you are here, you can walk either toward Chinatown or toward the Glover Garden area. 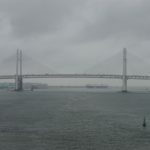 Our cruise ship had two stops in Yokohama no a recent set of voyages, and the convenience of the Osanbashi terminal made the visits even more enjoyable. The staff inside the terminal were very friendly, and the vicinity to the warehouses and shops in town was also nice. The artistic design of the exterior is pleasing on the eye, and it’s nice to see locals come by to see the ship. 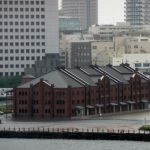 Our ship stopped twice in Yokohama on a recent set of cruises, and I was able to see different sides of the warehouses. On the first visit, I went through the buildings and looked at the very interesting souvenir shops inside. The next time we were here there was a beer festival going on. Overall, this is a nice venue for shopping and for entertainment. 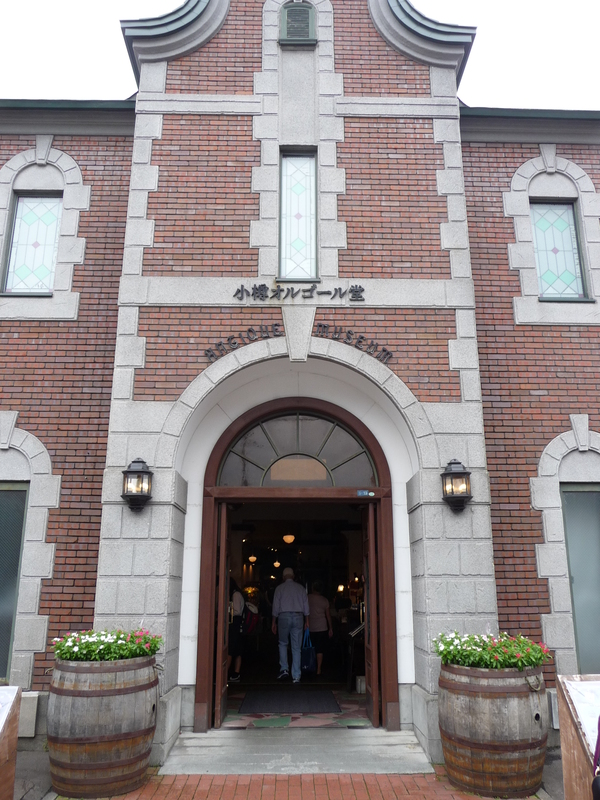 See my blog post on the Yokohama Oktoberfest that I attended at the Red Brick Warehouses. 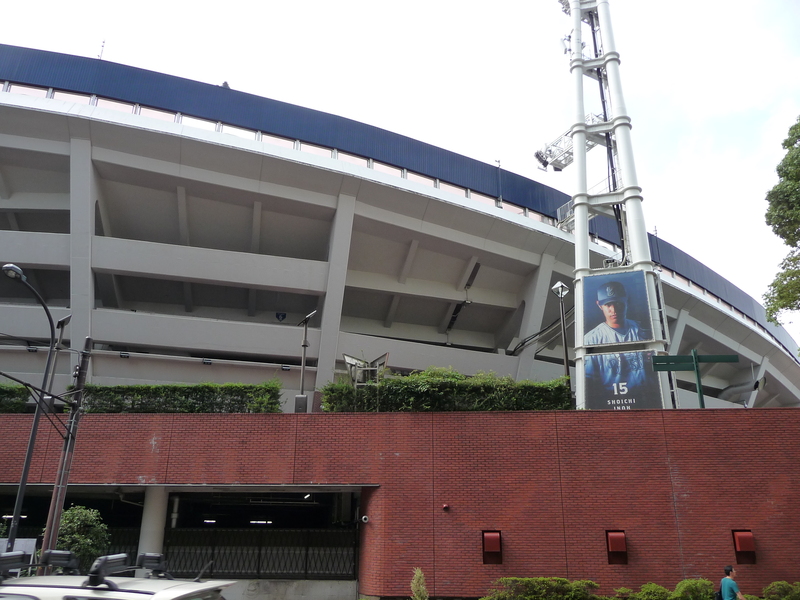 The Yokohama Stadium is a nice looking facility right in the middle of the city. It would be nice if it were open to visitors even when there’s not a game being played. I was able to see some of the outside as I walked by (and a few rows of seats as we looked from the top deck of the cruise ship). Maybe there’ll be a a game we can attend on our next stop! 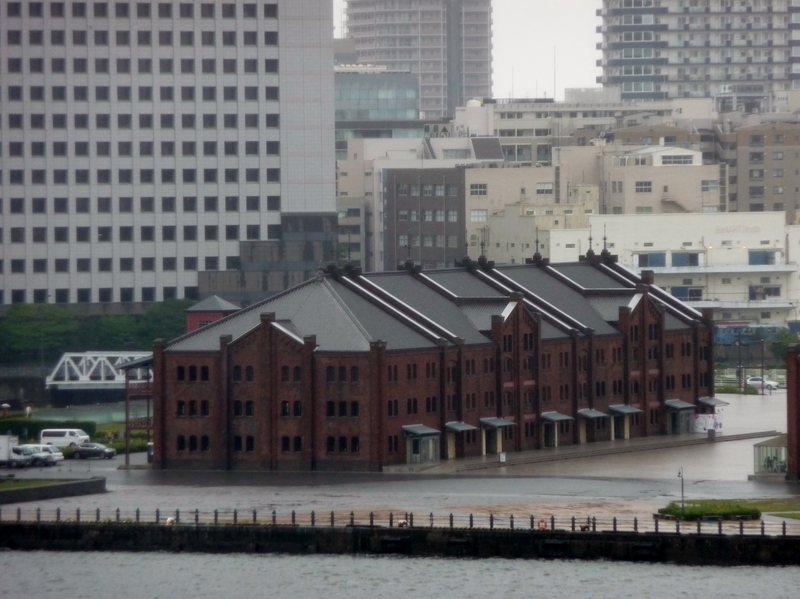 The Red Brick Warehouses have a great history; the place where fishermen used to bring in their daily catch for selling and for storage. Today the warehouses have been converted into shops, restaurants, and the occasional beer hall. I really like that there is a fee-free currency exchange machine that gives you almost spot rate for your currency in exchange for the Japanese Yen. 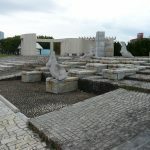 Plan to spend some time here on your next visit to Hakodate. You just might find that souvenir you were looking for! 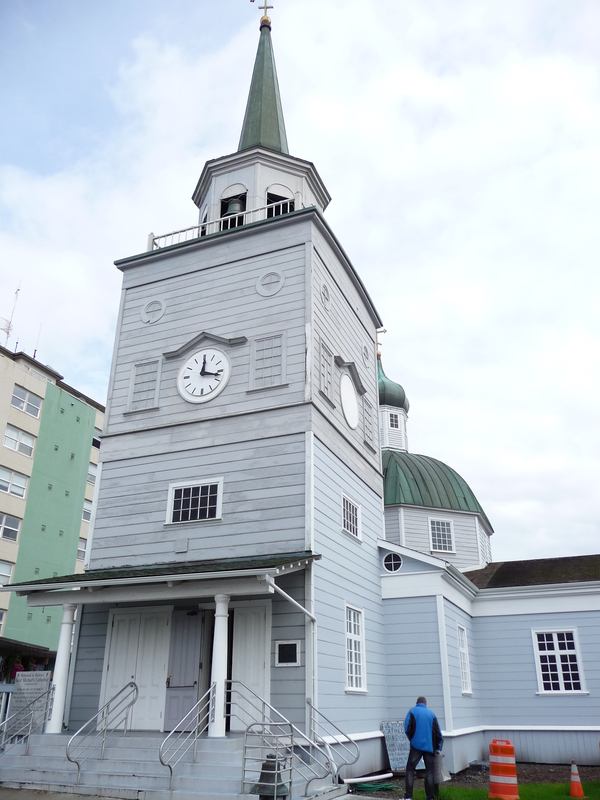 I’ve walked by this building on previous cruise ship stops in Hakodate. This time I decided to go in and look around. 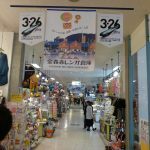 There are many interesting souvenir items for sale by various vendors, and they’re all very nice. I particularly liked the small souvenir items blown from glass. The historical items on the main floor are free to look at, but there is a charge if you want to go upstairs to look at some of the more interesting artifacts. 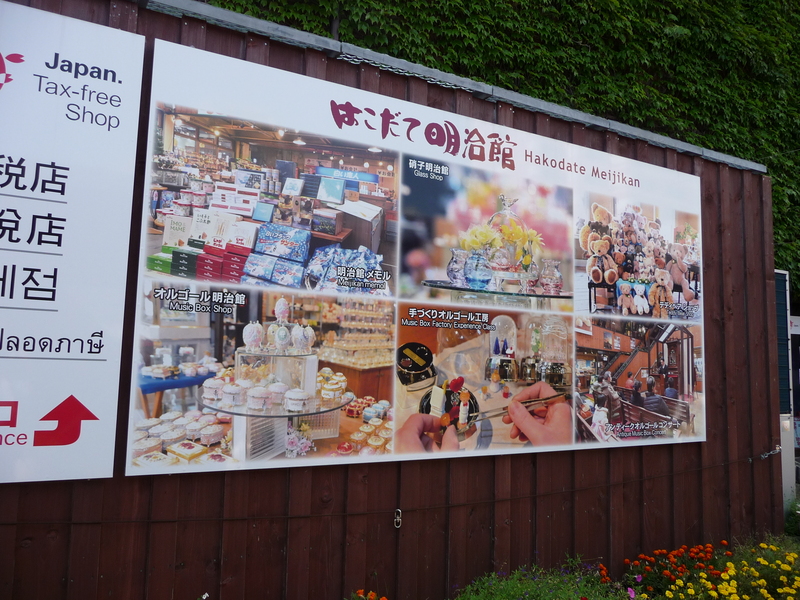 A trip through the Hakodate Morning Market is a MUST for any traveler to the port of Hakodate. 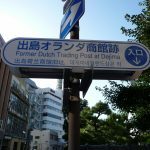 Located just a few steps away from the main JR Train Station, this bustling area has the local fresh (and cooked) seafood that the locals are looking for. 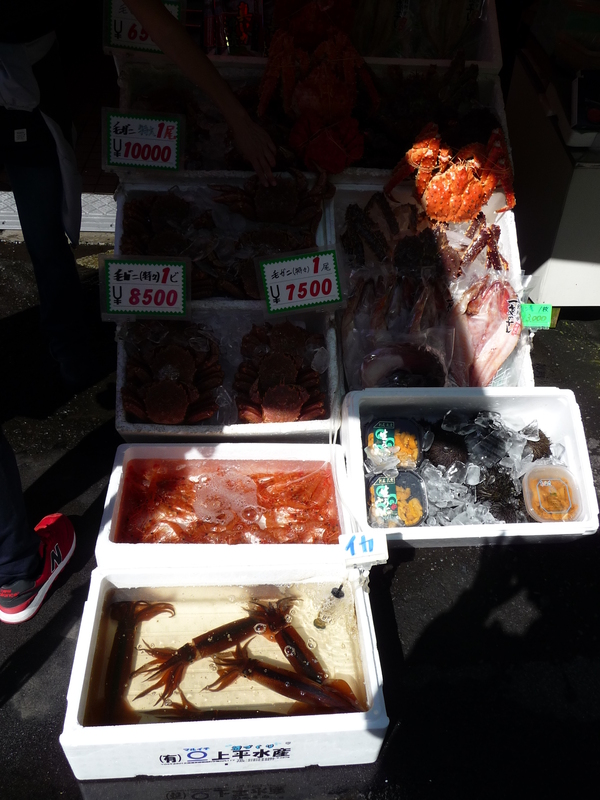 Fresh squid is a local delicacy, so you’ll see lots of it around. There’s also plenty of cooked crab, or you can get some fresh and cook it on your own. 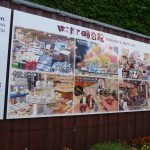 For the traveler (as I’ve been on my two stops in Hakodate), it’s best to walk through the market and then sit down in the restaurant area and treat yourself to a tasty delight! 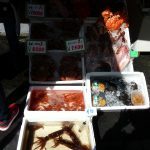 Even though it wasn’t at the Morning Market, and it was a year earlier, see my blog post about The Lady at the Sushi Restaurant whose natural instincts made me feel very comfortable in a place where I was the only non-local. 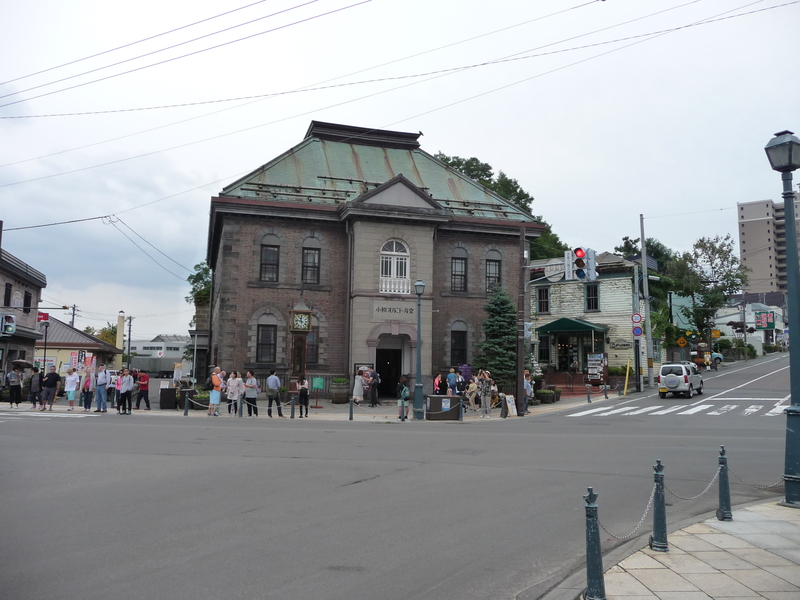 This is building #2 of the Music Box Museums on Sakaimachidori (the main shopping street) in Otaru. 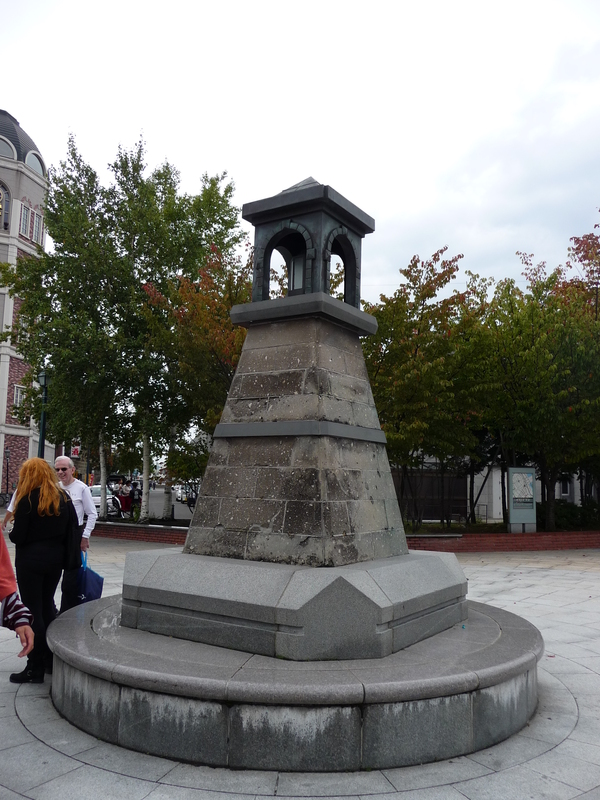 It is located right near lamp post 67 just a short distance from the Steam Clock and the Marchen Intersection. Check out the antique music boxes inside here, and listen to the delightful sounds coming from the many different types of the music boxes. Warning — if you stay inside for too long, you’re going to be tempted to buy at least one of them as a take-home present (not that it’s such a bad idea!). 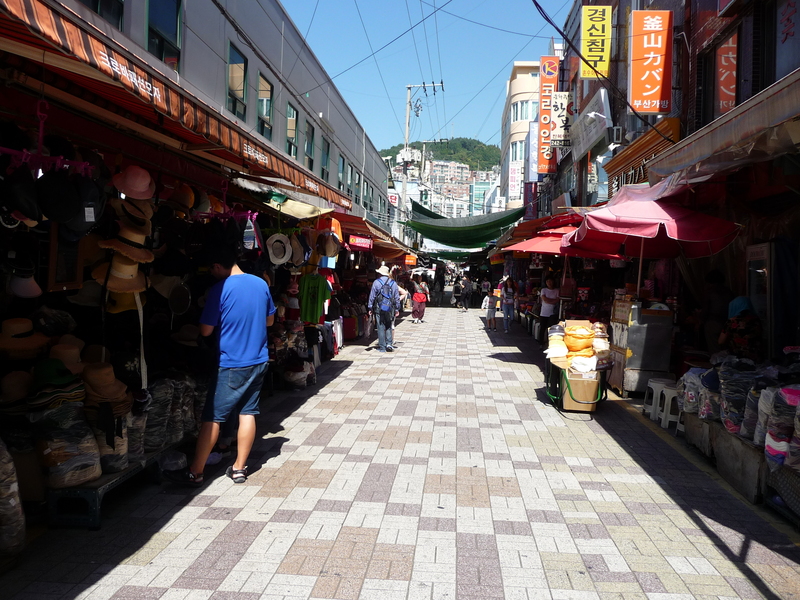 This is the main shopping area in Otaru. 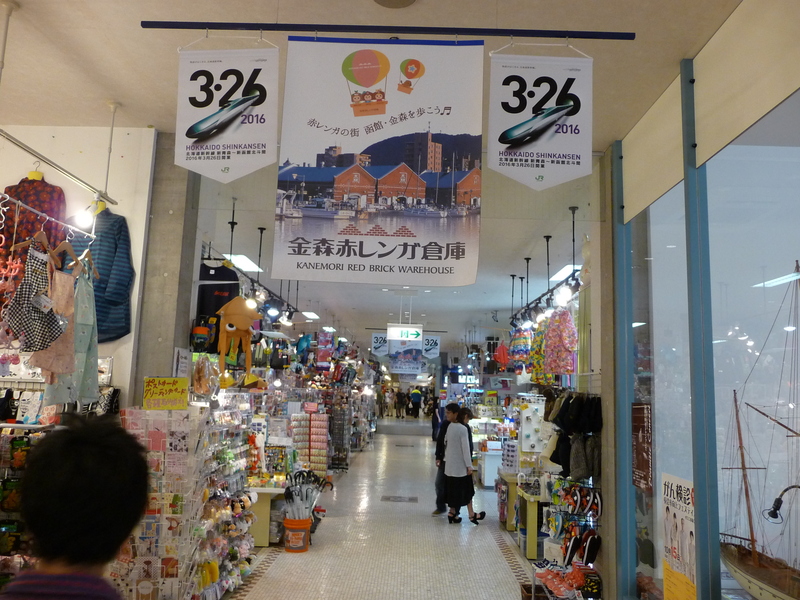 There are a couple other “shopping centers,” and covered streets, but Sakaimachidori is THE place to shop in Otaru. It’s so good that you will find yourself surrounded by many locals. 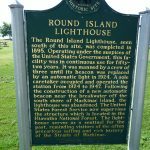 The first place to visit is the Tourist Information Center, which is adjacent to lamp post number 65 on the west side of the street. Yes, the lamp posts are numbered as reference locations. At the Information center, pick up a copy of the “Street Scene Map” which is actually a thick booklet with descriptions of everything along the street. Then go walking strolling, and shopping. 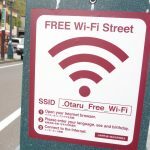 It’s a great way to spend a few hours in Otaru! p.s. 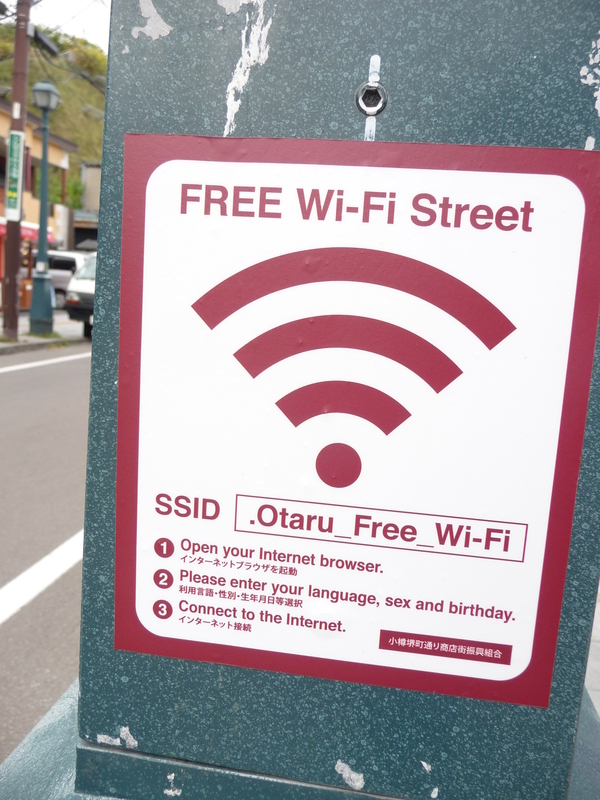 There’s free Wi-fi along the street. Rating: 5 Stars (I had originally given this 4 stars; upon reflection, however, I decided it deserved all 5! 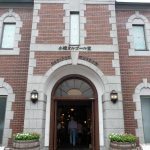 This is a great place to begin your journey down Otaru’s famed shopping street, Sakaimachidori. 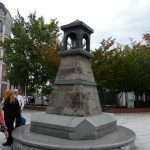 The 1994 gift of a Steam Clock from Vancouver, B.C., Canada, is right outside, and the Marchen Square (or intersection ) is across the street, so you can’t miss this place (it’s where all the tourists are standing next to the free-standing clock!). There are three floors to explore inside the museum, so make sure you visit all of them! 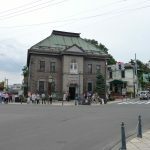 The perfect place to begin your visit to Otaru’s famed Sakaimachidori street is to meet at Marchen Intersection. All you have to tell your friends is to meet you either at the Steam Clock or at the Bell Tower. The plaza area is large enough to hold many people, yet small enough to find your friends. 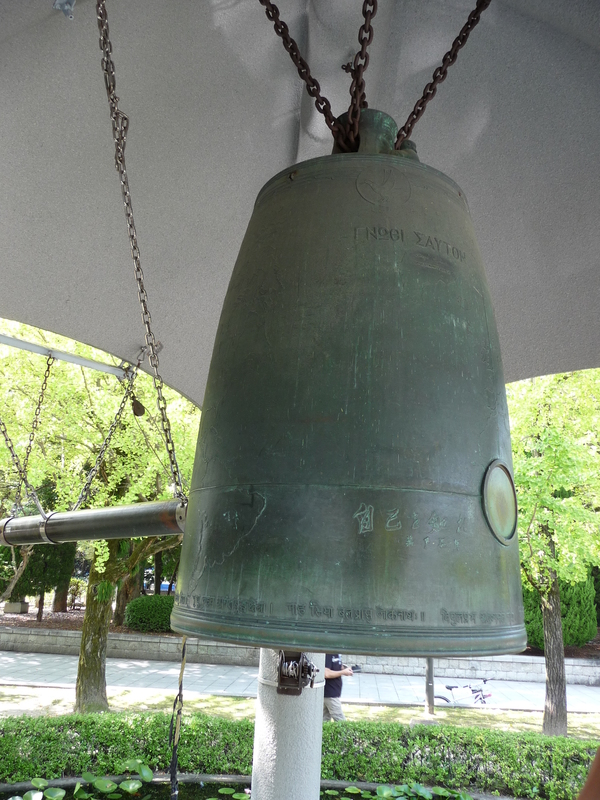 While there you can listen to the chiming of the bell tower overhead or the steam clock across the street. The nice thing about walking up the slope to the site of the Baranof Castle is that you get some nice views from the elevated area. It’s also free, there are some signs to read about the history of the area, and you don’t have to spend much time. 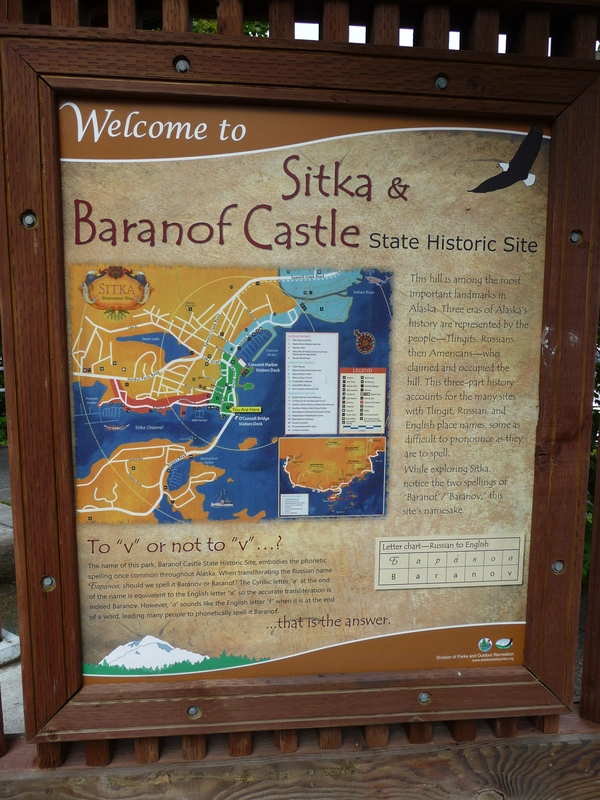 Other than that, the site isn’t one of those must see places in Sitka. 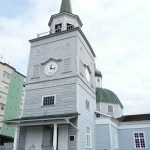 The Russian Orthodox Cathedral (burnt down in 1967 and rebuilt 10 years later) is a key piece of the history of this area. The original building also played a role in the purchase of “Russia America” by the USA. The cathedral isn’t in the best physical condition, and it seems they are always trying to do some remodeling each time we come through the area. 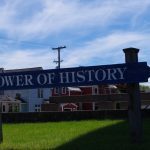 Don’t let that stop you, however, as it is important to the town of Sitka and in the development of Southeast Alaska. Unless you’re a die-hard history buff, you don’t have to spend too much time inside; just wander around and read a few of the placards. 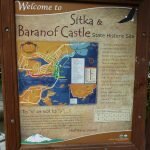 See my blog post about Sitka and some of its highlights. 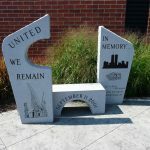 I was walking along the area in front of the library along the Erie waterfront when I saw the ERIE 9-11 MEMORIAL. 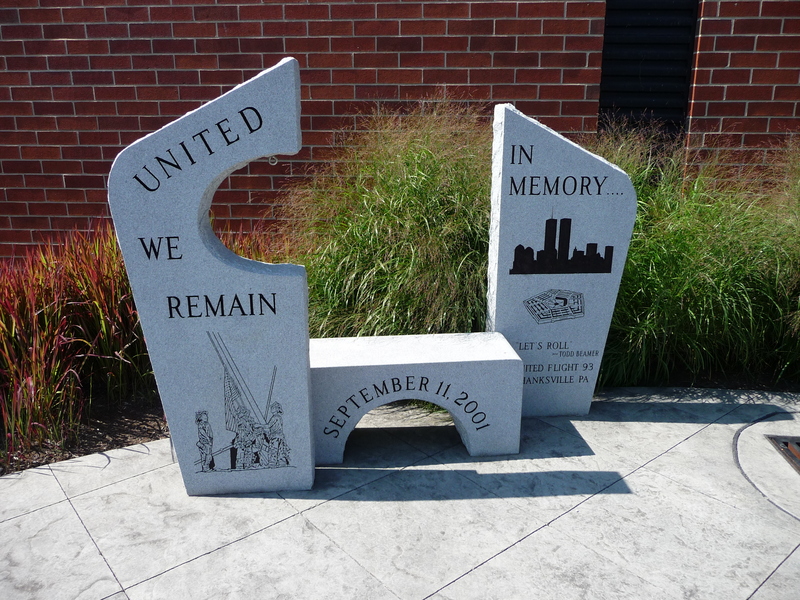 I stopped and read everything that was there; it was such a moving and incredible outdoor memorial. It should be on tours for people to see the timelines and photos and absorb the pathos of this incredible site that is dedicated to an awful piece of our history. Our cruise boat was in Erie on Monday, July 31st, when the Art museum was closed. That was too bad as I wanted to go inside and see some of their exhibitions. 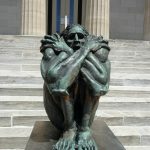 I did think that the sculpture out from was quite interesting — a huddled screaming creature. Was this a take-off on “The Scream”? Probably not, but it was a different pose. Hopefully it won’t be a Monday when I’m back in town in 2018. 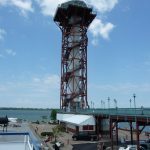 The Port of Erie Bicentennial Tower provides amazing views over the port as well into the downtown area that rises up a gentle slope from the port. There’s a small charge ($2) to walk up the stairs to the top, and just a few dollars more ($4 total) to take the elevator to the top — take the elevator! 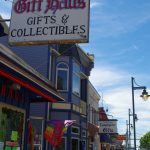 While you’re in the area, you might also choose to get an ice cream or a soda from one of the local vendors. Our cruise boat docked at the southern end (Pier S) in Burnham Harbor right alongside Lakefront Trail. 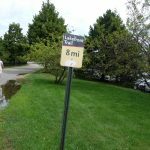 It was interesting to see so many people out jogging and biking along the trail. Walkers were welcomed, but needed to stay to the right for their safety. We even saw many police officers riding bikes along the trail, showing it was safe to be there. 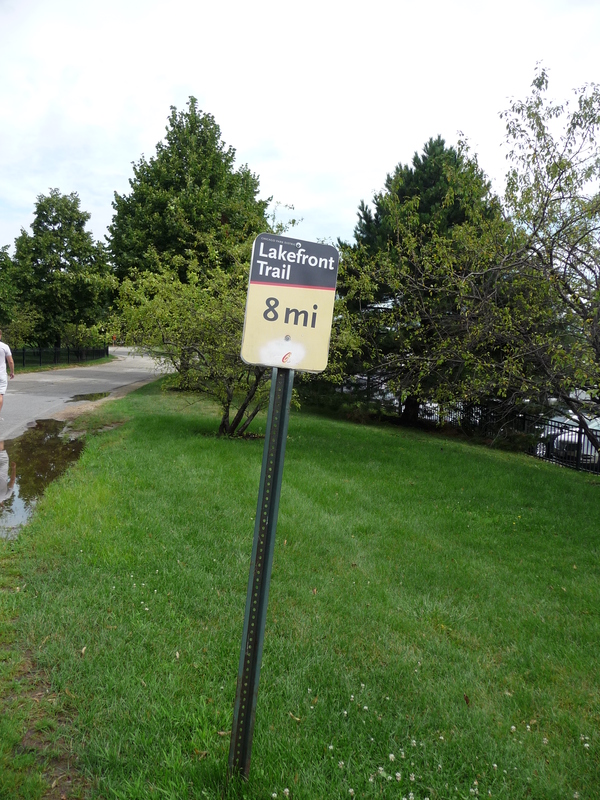 I don’t know how far the trail goes, but we saw it up near the Planetarium and extending way past McCormick Place. 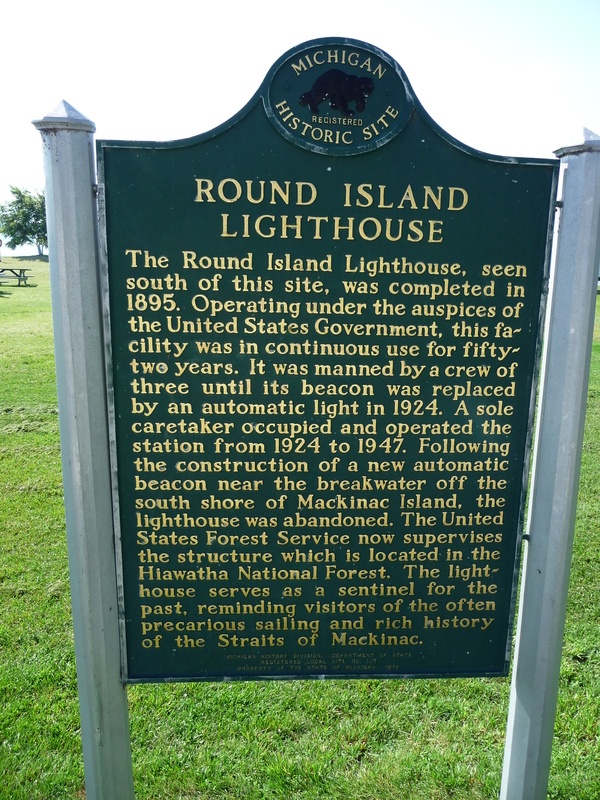 The Round Island Lighthouse (an interesting name in itself since the island isn’t round!) 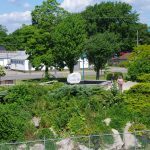 no longer functions in that capacity, but it is a good reminder of the importance of protecting boats and ships on their perilous journeys in the Straits of Mackinac. 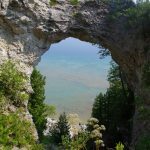 It sits on a breakwater that extends out from Mackinac Island and is a favorite photo shot for many amateur photographers as they approach the island. Bridal Veil Falls is clearly the narrowest of the Niagara Falls at about fifty feet wide, but it is nice to see a small section of water pouring over the rocks toward Lake Ontario. You have a nicer view of these falls from the Canadian side or from a boat ride than you do from being on top on the American side. 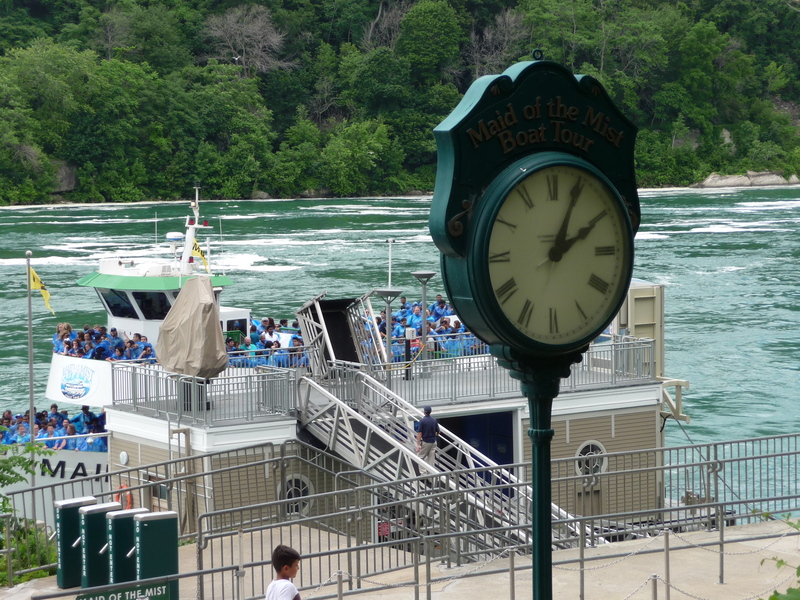 I am always amazed at how many people want to get soaked when the boat ride takes them near the Niagara Falls. I don’t mind a little mist, after all the boat from the American side is called “Maid of the Mist”, but I don’t need to get completely wet. 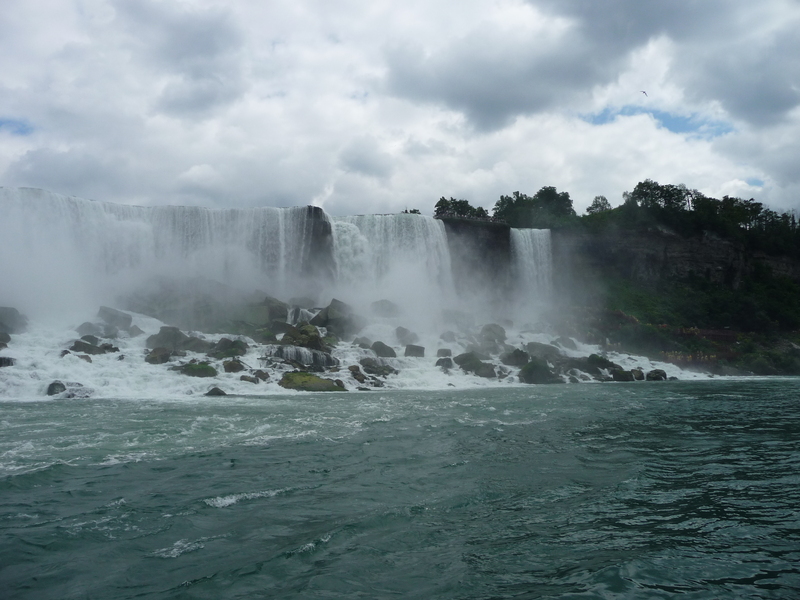 The boat ride was very good with spectacular views of the American Falls, Bridal Falls, and then Horseshoe Falls. The blue poncho definitely helps keep you mostly dry, especially your camera gear. Most people don’t consider going inside a Welcome Centre when you have such beauty surrounding you. But you can actually get some spectacular views from this two-story building. There are also many shops and casual eating places inside, but the views are the main attraction for me! 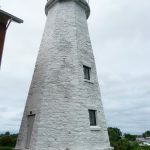 The location of this lighthouse seems rather strange, unless the port/marina area has greatly expanded since the lighthouse was first operational. 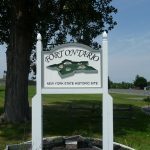 Its current inland location makes you wonder how it would help ships out on Lake Ontario. 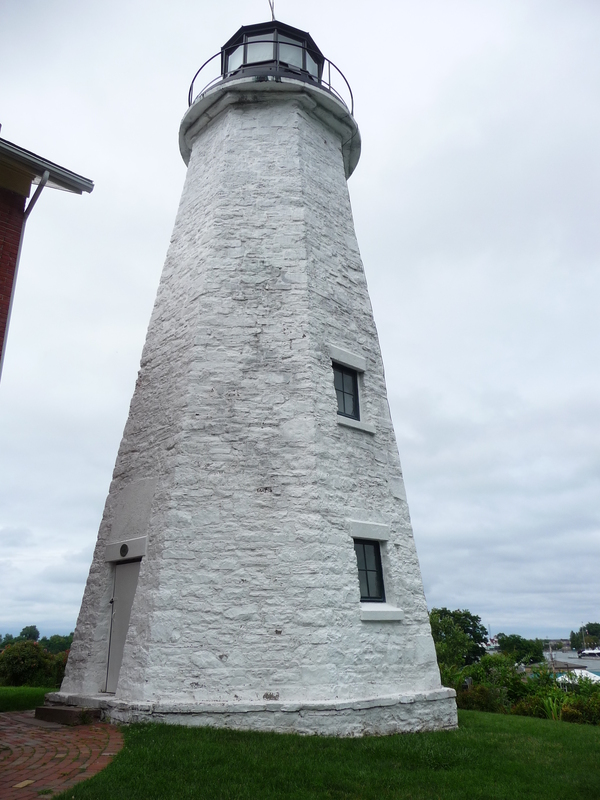 We’ve been there a couple times, but we never seem to find the lighthouse open. 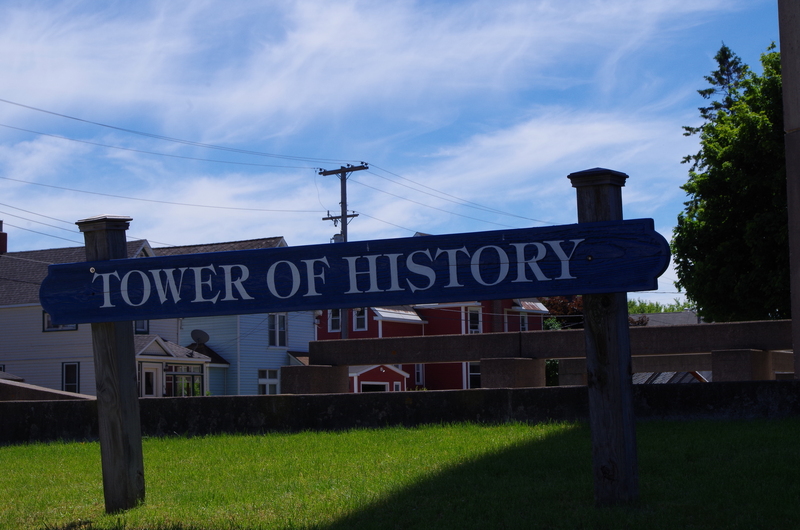 There are some interesting story boards around the area, along with some flags. Maybe on the next visits in 2018 . . . . This as the second time our cruise boat had docked in the Port of Rochester. 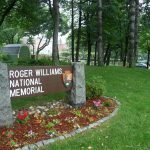 The city of Rochester itself is about a few miles inland, so this is more of a service area. The port facilities at the marina are modest at best, but there are a couple shops and restaurants (and an expensive custard store). 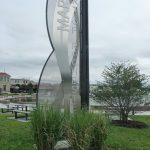 There are a few places within walking distance (less than a mile), including a very nice park and beach at the end of the marina area. 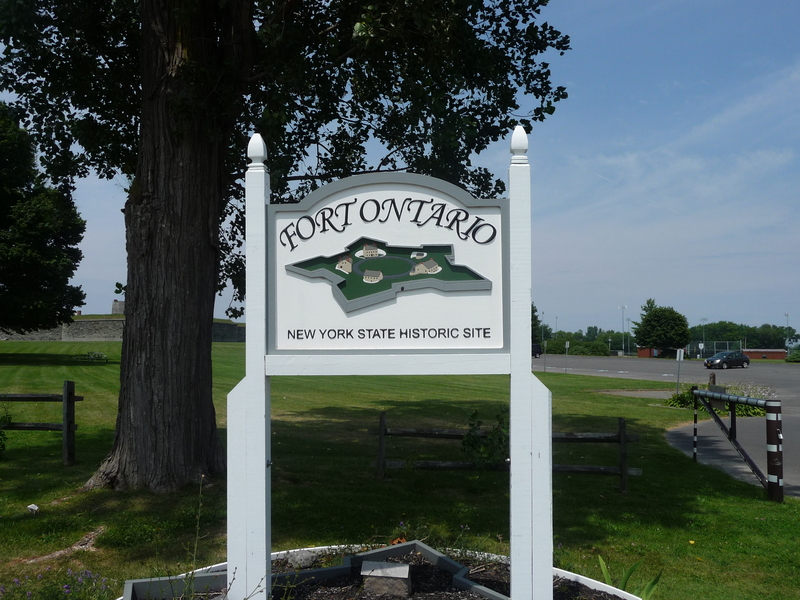 Our cruise boat docked in Oswego and so we walked to Fort Ontario. It played an important role during the Revolutionary War and the war of 1812. The insides of the buildings and accessible areas don’t explain that much of their functions, but some have been converted into museum halls. 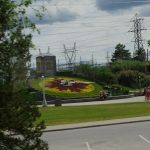 Walking along the grassy hilltops gives a good view of the area — not only can you see out onto Lake Ontario, but you can also see why this was a strategic location. 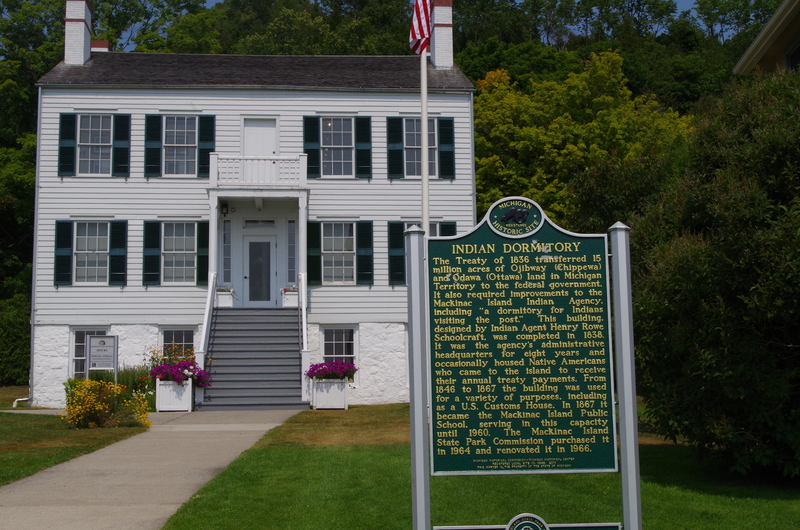 While most people think of the Baseball Hall of Fame when they hear the town Cooperstown, there is much more to the area. 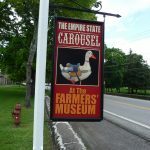 The Farmer’s Market, about two miles outside of the main town contains a great collection of buildings, some original and some replicas, of “farm life” in the 1800s and early 1900s. Some of the buildings are staffed by people in period outfits to explain the particular building — blacksmith; lodging; print shop, etc. It’s also fun to see the live animals enjoying their life on the farm. They also have a couple small garden areas where you can see some of the crops being grown. This is a mostly outdoor activity, so wear a hat and drink water! 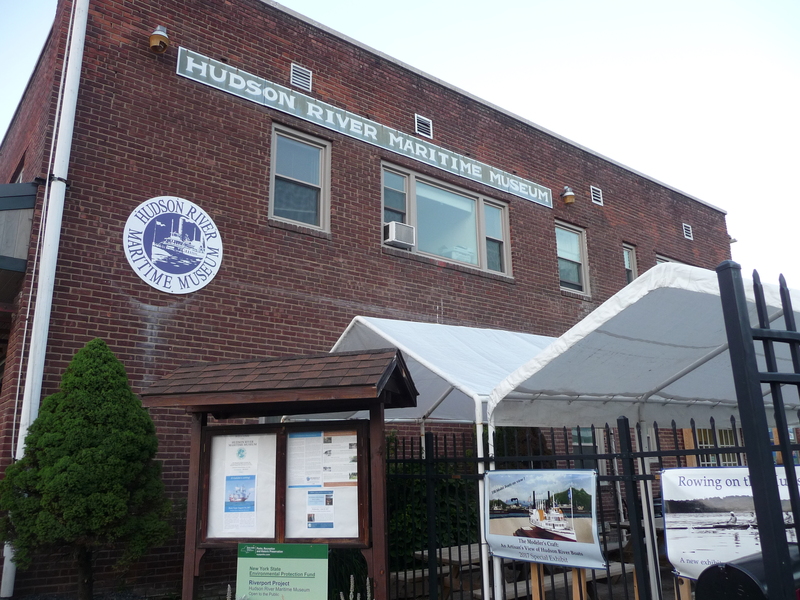 We docked in Kingston for an overnight stay on our boat ride up the Hudson River. 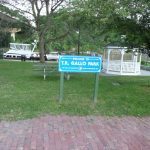 We took a walk and came upon this delightful park that beckoned us stop take some time and stroll through it. It was a nice little visit and a nice park, quiet and peaceful. 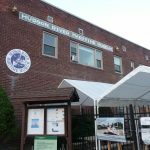 The Hudson River Maritime Museum in Kingston contains many important artifacts that are representative of the importance of the Hudson River. 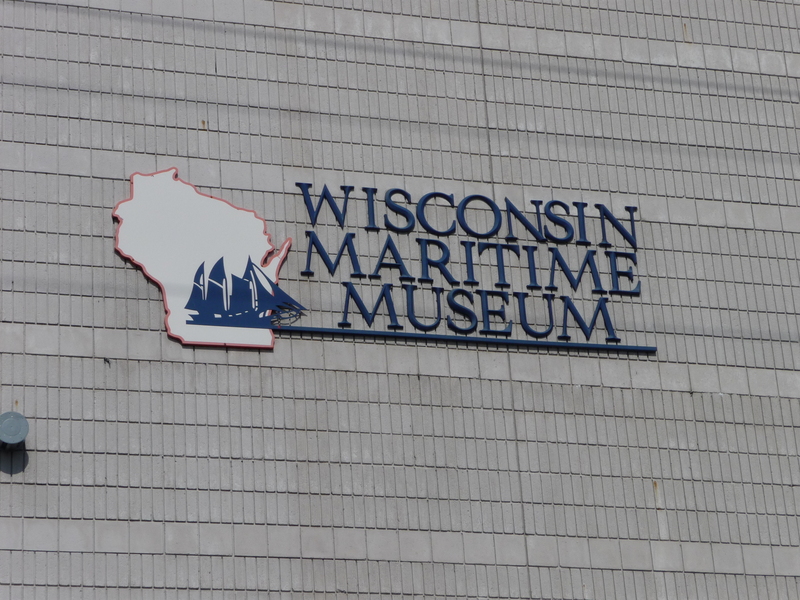 The museum is located right on the harbor, so our small cruise boat docked right next to it. 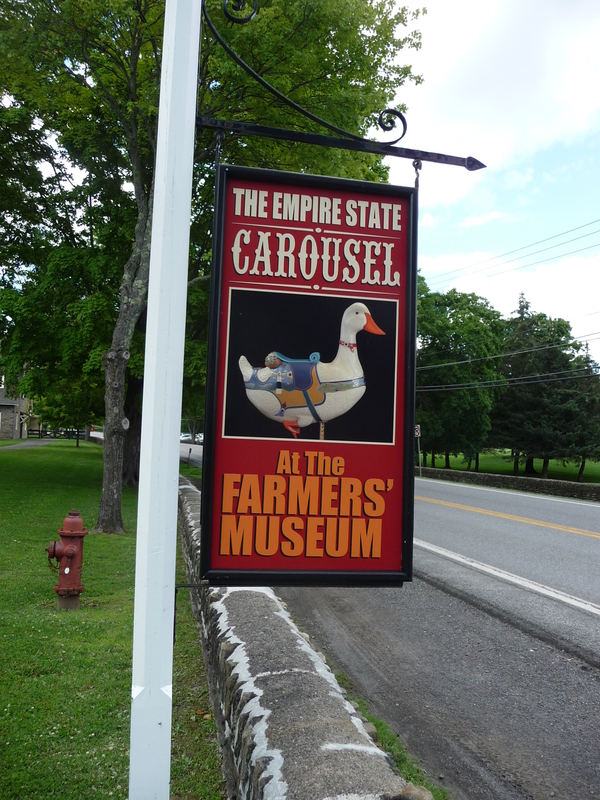 This made it very convenient to visit the museum as well as walk into town. 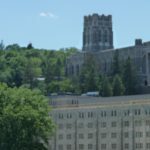 I’d been to West Point before (on an exchange weekend when I was at Navy), but it had been 50 years, so this was like a new experience for me. Our ship tour highlight was visiting the Cadet Chapel, seeing the combat flags, the pipe organ, and all the stained glass windows. 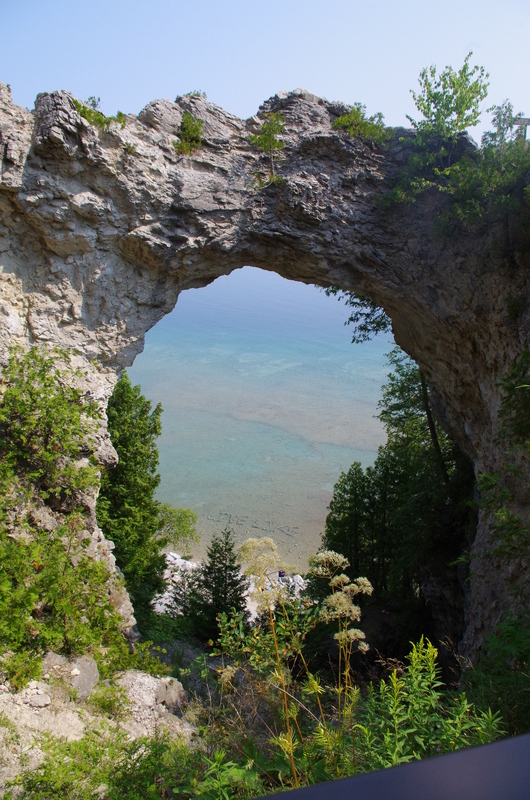 We visited Trophy Point and a couple other “visitor access” area. 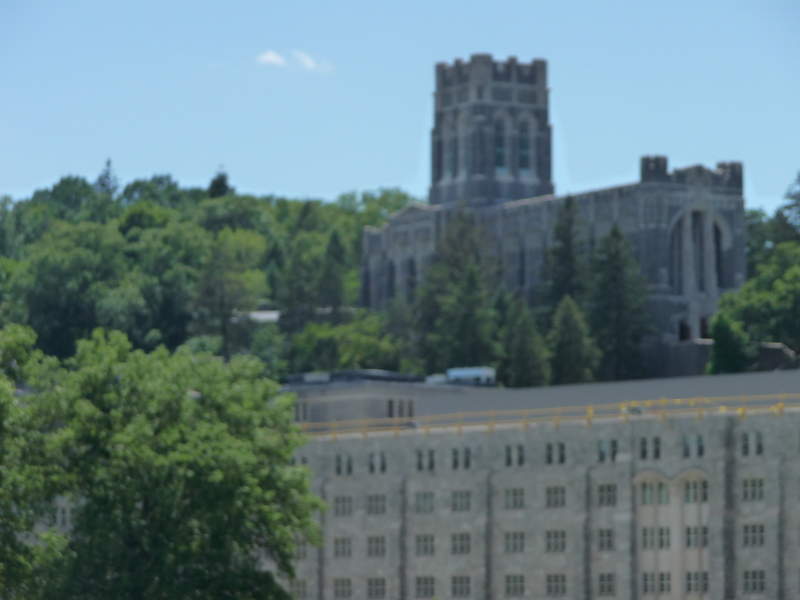 The views along the Hudson were magnificent, and it’s easy to see why this area (the “west point” on the Hudson River) was an important place to protect. 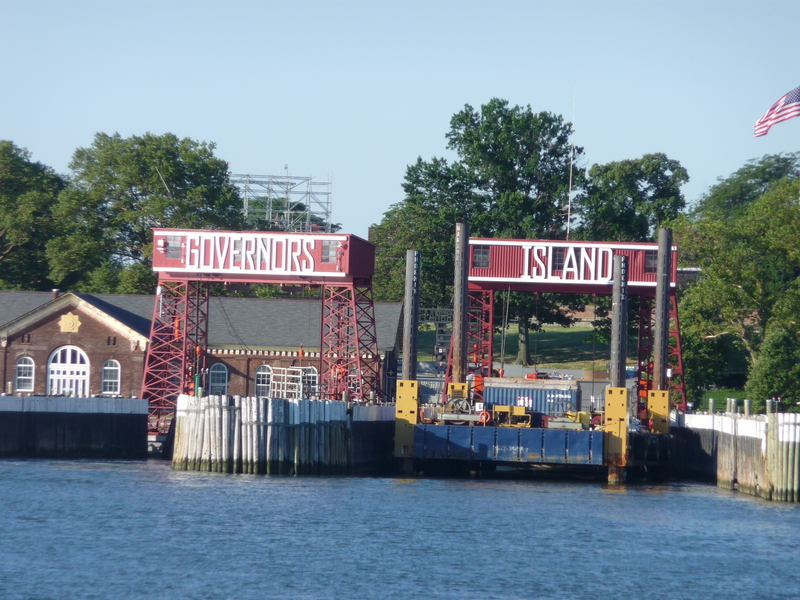 Governors Island contains some interesting history that most Americans don’t know about. It’s worth taking the ferry over to it the next time you’re visiting New York City. You don’t have to spend all day; two hours will be plenty. The Providence Place Mall is quite a large shopping mall with a food court and movie theaters. 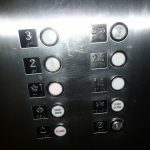 The convenient items, such as escalators or elevators, are not all the conveniently placed. We spent more time than we thought necessary looking for these items to move from floor to floor. 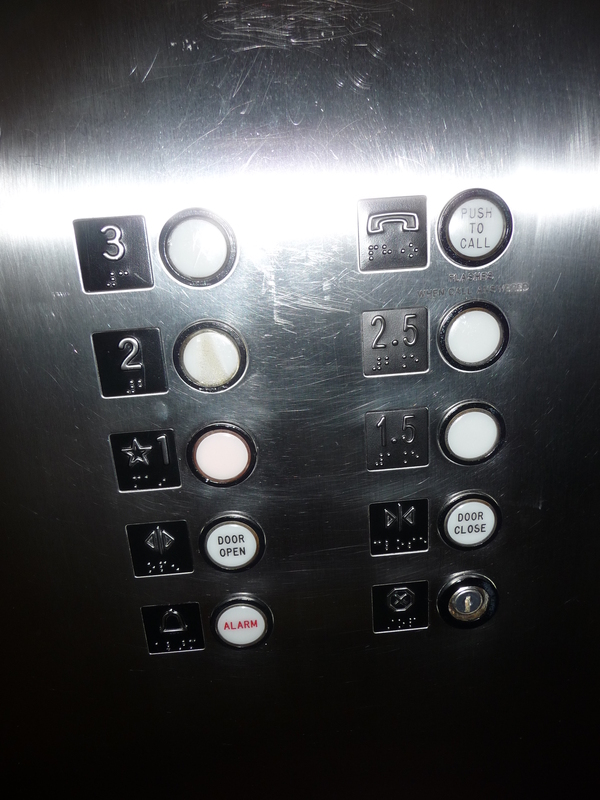 When we did find an elevator we weren’t sure what we would find on floor 2.5! 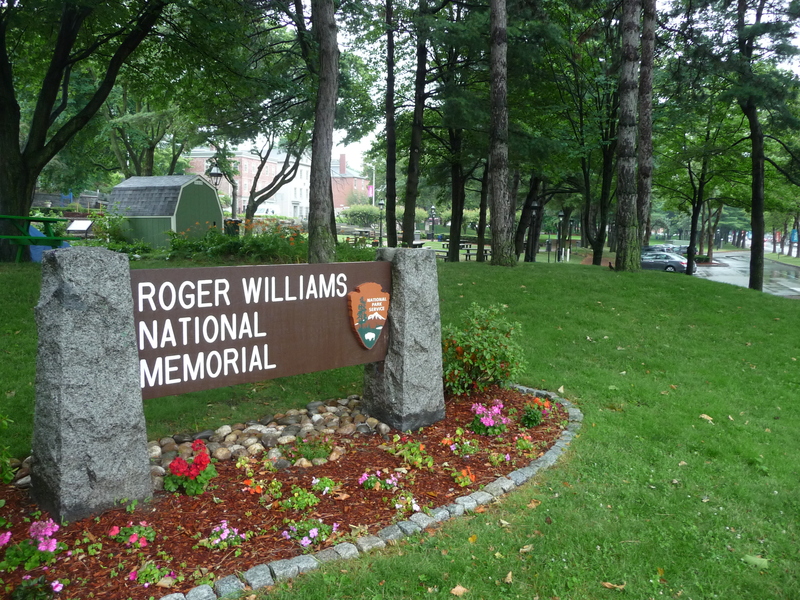 Although the park area is not very large, it is well landscaped with flowers and story boards that tell some of the history of the founding of Providence. 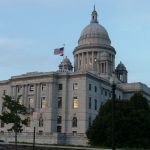 Also, its proximity to downtown and the State House make it an ideal relaxing spot during a short break from the daily grind. 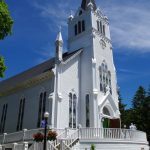 The parking here also allows you to visit some of the other nearby attractions — such as the churches that were instrumental in the city’s founding. 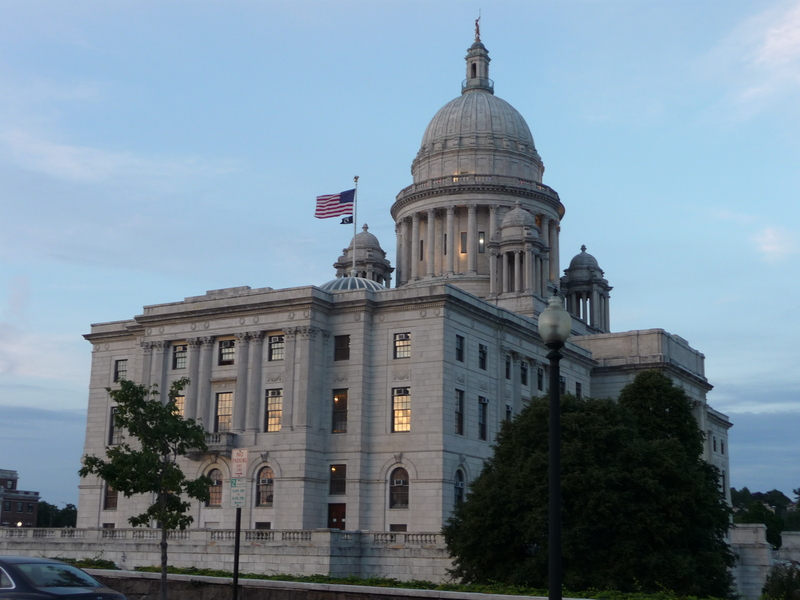 The architects for the Providence State House saw the beauty of placing it on top of a hill overlooking the city. The building is slightly reminiscent of the U.S. Capitol in Washington, D.C., with its tall central dome and two assemblies on either side. We were able to take a self-guided tour through the building with its expansive open area below the main dome. The impressive two-level library houses books and ledgers from the very beginning of the state’s existence. This is worth a short visit on your next visit to Providence. Our cruise boat docked at the Manitowoc Marina next to the Maritime Museum. It was a convenient location, close to town; nice trees with shade. 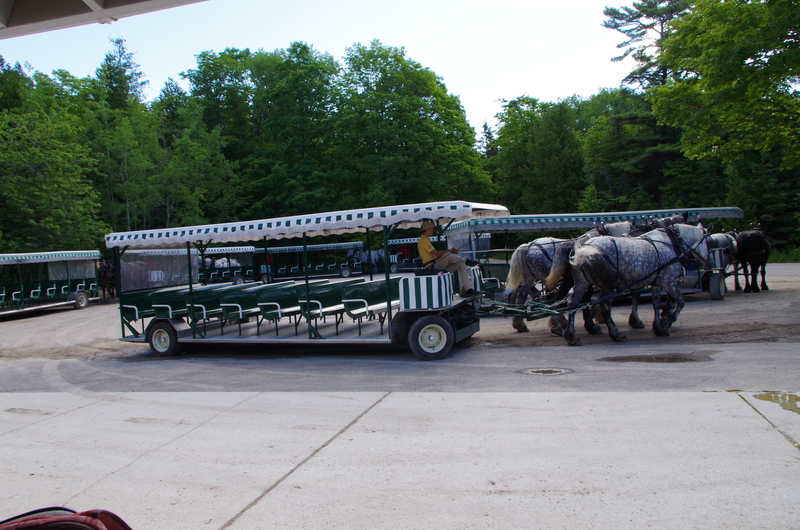 There is plenty of parking space available in the shared lot, and there’s no charge for parking! 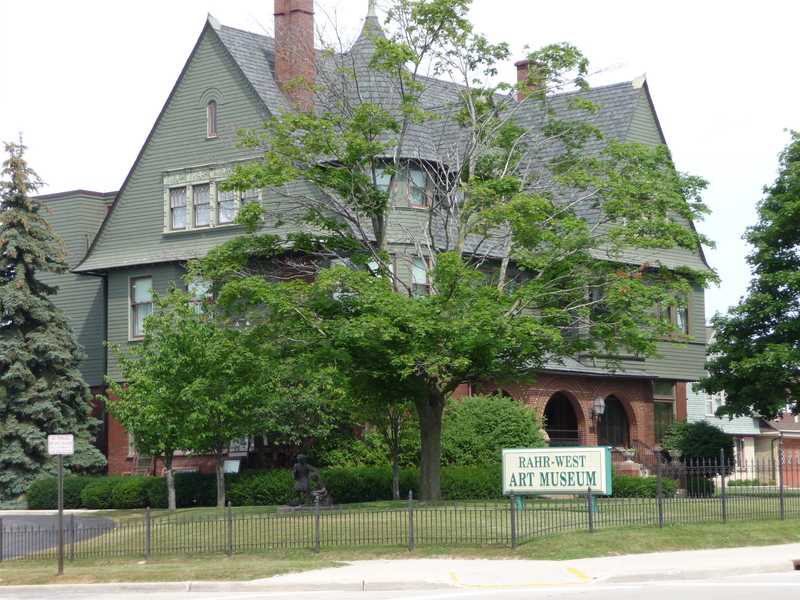 Our cruise stopped for the day in Manitowoc, and so we walked up 8th Street to the art museum. The air conditioning inside felt nice as soon as we entered. The main exhibit we wanted to see was their display of Marc Chagall’s 1967 38-plate lithograph collection of “Le Cirque.” It was very impressive to see the entire set on display. We wandered throughout the mansion and were delighted to see such beautiful furnishings and more great art. 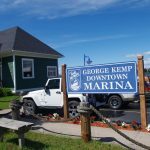 This is a MUST-VISIT location on your next stop in Manitowoc! Our cruise boat docked for a couple days at the S pier in Burnham Harbor and we were able to go walking along the Trail that borders the lake. Depending on how far you want to go (it stretches for miles), you can visit museums, parks, etc. It’s a nice place on the edge of the city, and it’s alsos fun to see some of the private boats heading out into Lake Michigan. 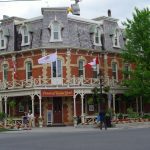 Whether you walk along the river or take a boat ride, you’re bound to be impressed with the history of the area and the impressive architecture. 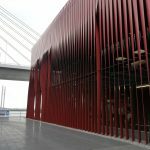 There is a boat tour that focuses on Architecture — it’s worth taking! Also, as you go along, you’ll see lots of restaurants to tempt your taste palate! I had to take someone to O’Hare Airport, and rather than taking taxi or Uber we took the CTA Blue Line from the Clarke/Lake station near the river. The train was prompt, efficient, the cars were clean, and we probably got there (on a Monday morning) before we would have made it via a car. The station at the airport was easy to navigate, and then it was easy to come back to town after her flight left. Chicago has done a good job with their transit system – thanks! Our cruise ship was docked right next to the Maritime Museum and so a visit there was very easy. The super-friendly staff gave us a map of the museum, along with some suggestions on how best to enjoy the exhibits. The models of some of the “lake boats” were fun to look at, and the huge steam engine was quite the engineering marvel. I also liked reading about some of the shipwrecks on the Great Lakes — not for the disasters, but for the attempts to save the crew, etc. 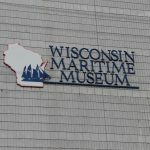 If you stop in Manitowoc, you MUST go to the Maritime Museum! 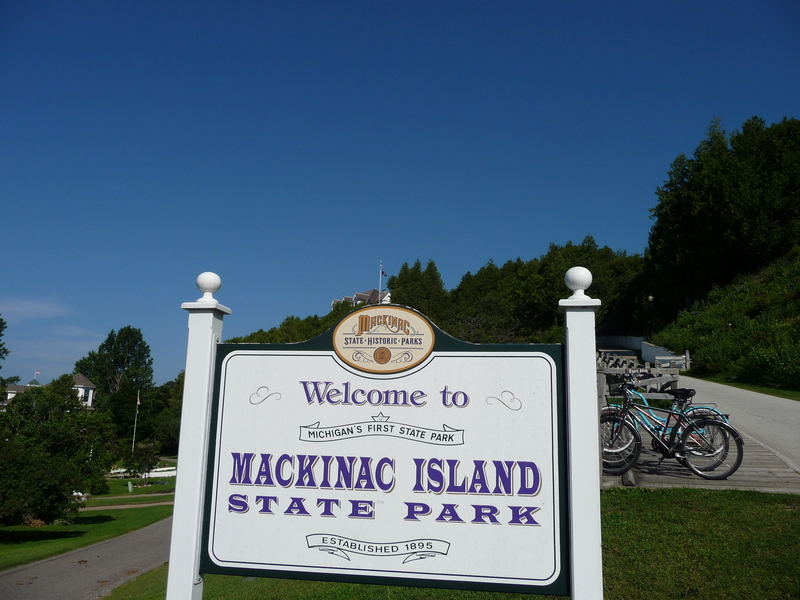 It seems that there isn’t much on Mackinac Island that isn’t part of the State Park. 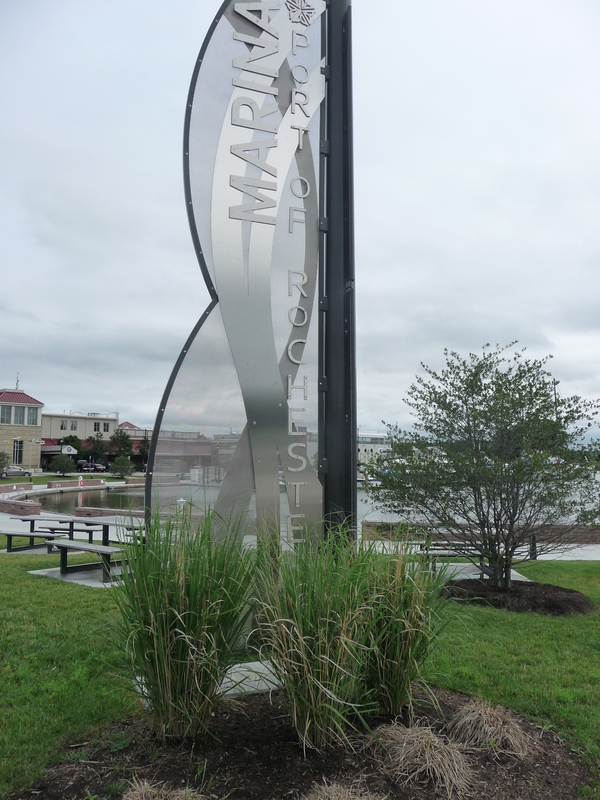 Close to the ferry docks is Marquette Park, part of the park system. 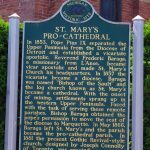 It honors Father Jacques Marquette who worked to bring Christianity to the local Indians in the Upper Peninsula of Michigan. 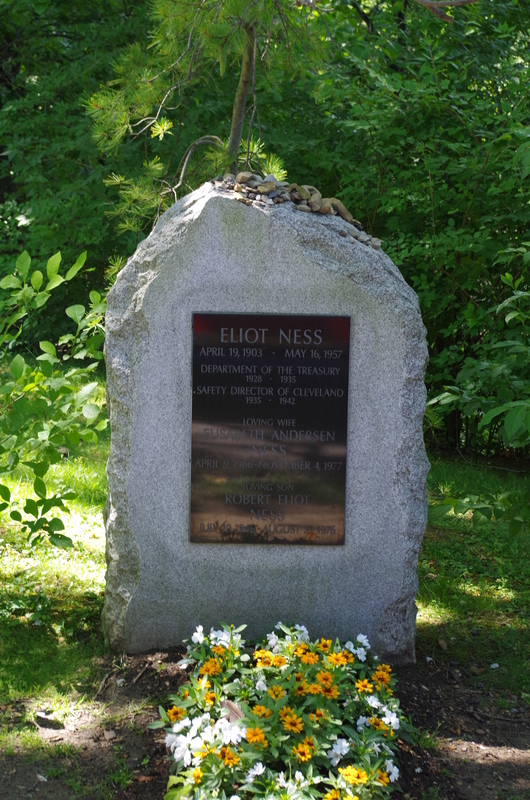 There is a statue of him in the park, which is just below Fort Mackinac. 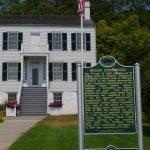 Once the center of John Jacob Astor’s fur-trading business, the Robert Stuart House is now a museum. That would be fine, but you are “kindly asked” to make a donation for the privilege of going through the museum. I don’t mind paying to visit museums; after all, they need funds to operate. But when I’m “kindly asked’ for a “donation” — I find that to be tacky. 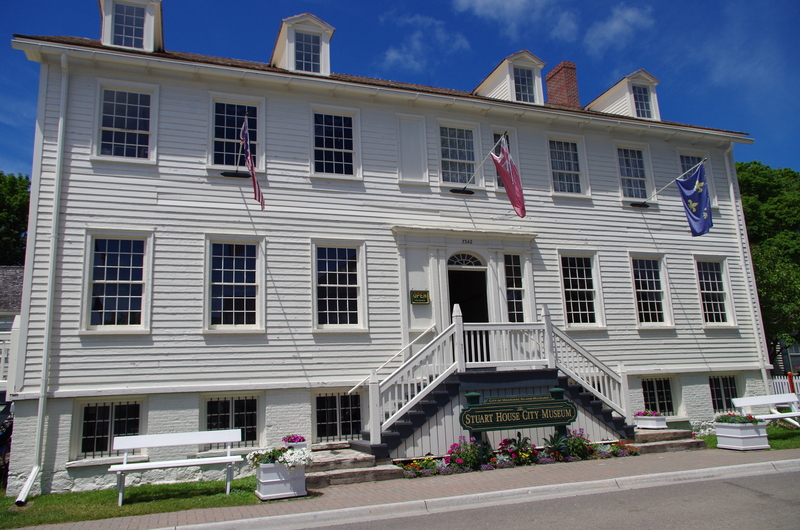 No trip to Mackinac Island is complete with a stop to buy some fudge. There are plenty of choices available, but I chose Murdick’s Fudge this time. Typically sold by weight ($15.95 per pound), they have a special of 3 slices (about half-pound each) for $19.95. I bought two slices to bring home (Butter Pecan and Michigan Maple Walnut) and then the cruise director got the third slice to take back to the crew. 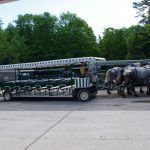 It seems that wannabe comedians come to Mackinac Island and drive the horse-drawn carriages when they can’t get work elsewhere. Both of our drivers were plying us with corny jokes and puns and then laughing the loudest. I would have preferred the plain information; I can watch the Comedy Channel if I want bad humor. Our cruise ship stopped at Mackinac Island on a Sunday. 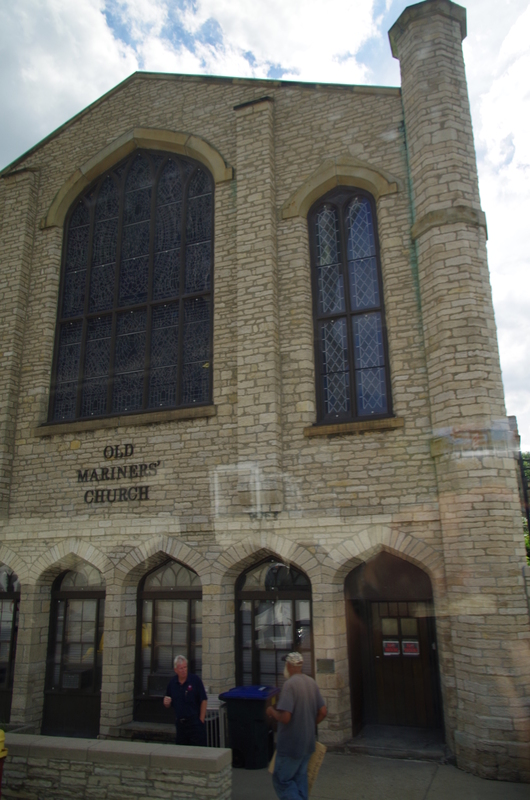 I found out quite by happenstance that there was going to be a concert at St. Anne’s that afternoon, so I went. The two sopranos gave amazing performances with songs from show tunes to opera to gospel to sacred music. The interior is quite charming with the tall ceiling and the stained glass windows. 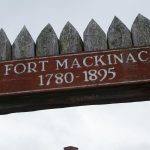 Our cruise ship tour included a stop at Fort Mackinac, where they have a saying something like: “History Repeats Itself; it does it here everyday.” With people dressed in period outfits, there are re-enactments of firing rifles and a cannon as they occurred in the War of 1812. 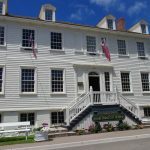 You can walk through various buildings, outfitted as they were 200 years ago, and there is a nice gift shop with books, souvenirs, and even sweatshirts if it’s a cold day! There is an elevator from the back entrance area, but it’s a long steep walk if you enter from the front. 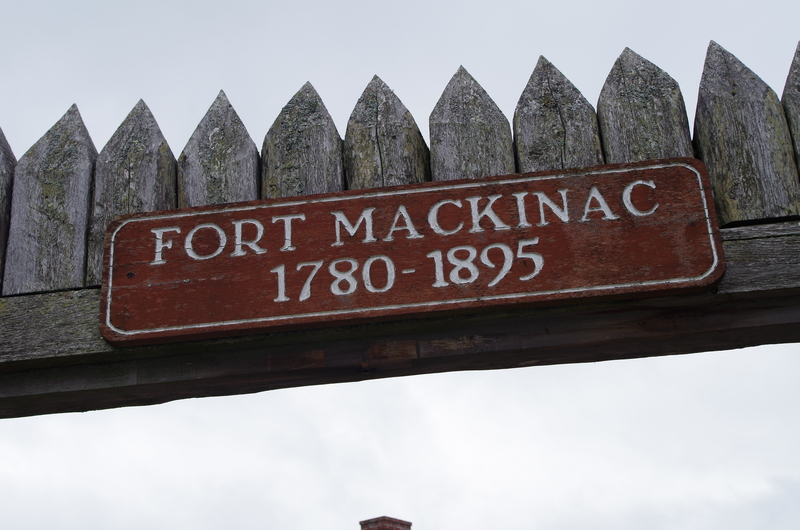 View my YouTube video on Re-enactment of Rifle Firing at Fort Mackinac — it’s about 1’15”. I’ve been to Arch Rock before, but it’s always a nice place to stop and try to take that one amazing photograph. 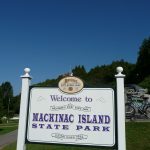 I had told people about the Arch Rock prior to arriving on Mackinac Island, and then several people came to me later to tell me how much more they enjoyed it because of my telling them about it. 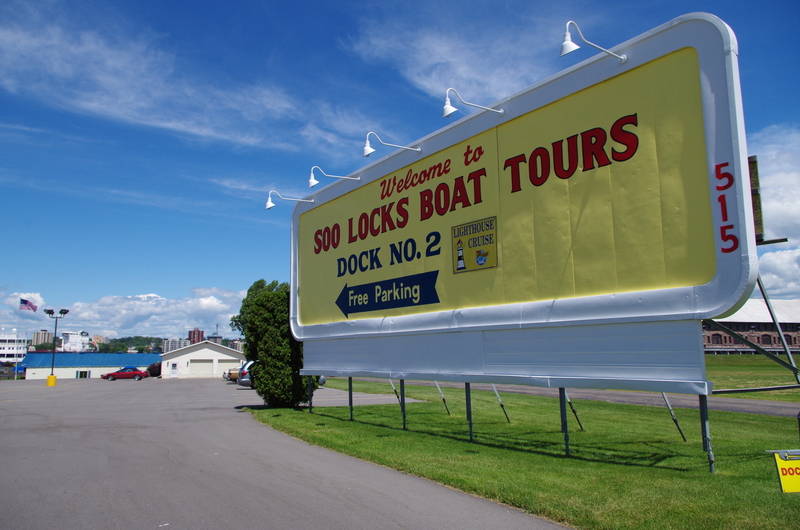 The office for the Soo Locks Boat Tours was very close to where we docked in Sault Ste. Marie. 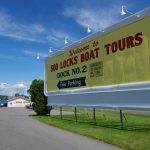 The boats look clean and well-maintained, and you can get a nice tour of the River and the locks from this convenient location. There is plenty of free parking available, and there’s a gift shop nearby. 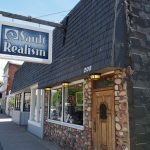 I spent a few hours walking around the main part of Sault Ste. Marie after our ship docked down by the Valley Camp. The German-sounding name of this shop, Das Haus, seemed a little strange to me, but it was worth a stop anyway. It looked like an average souvenir shop without much from the local artisans. But not everyone is looking for something local when they visit a place, so there’s clearly some demand for the items in this shop. Our ship docked in Sault Ste. Marie, and I went for a stroll in town rather than the organized tour. As I walked down Portage Avenue, I was pleasantly surprised to find a nice shop with amazing crafts made by local artisans. 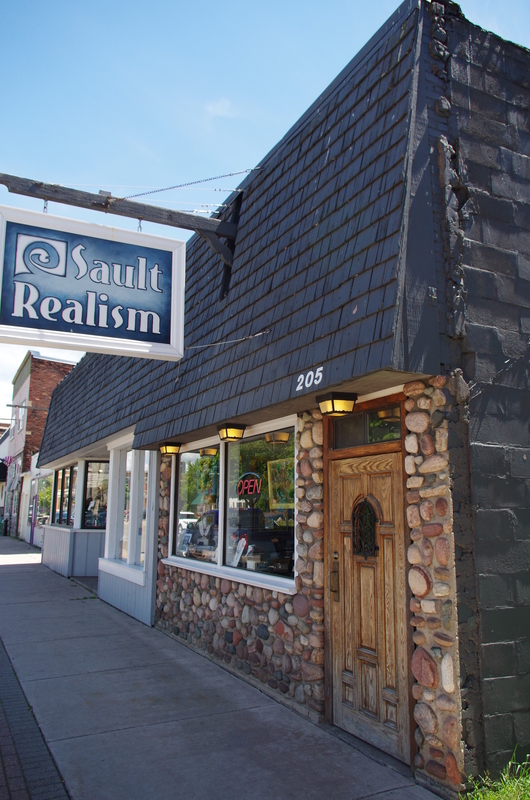 I like the name “Sault Realism,” as I think it properly conveys what you’re getting inside. After our cruise ship docked in Sault Ste. Marie near the Valley Camp, I headed out to walk around town. 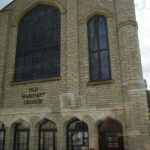 The beautiful Holy Name of Mary Church drew my attention and I had to go across the street for a closer view. 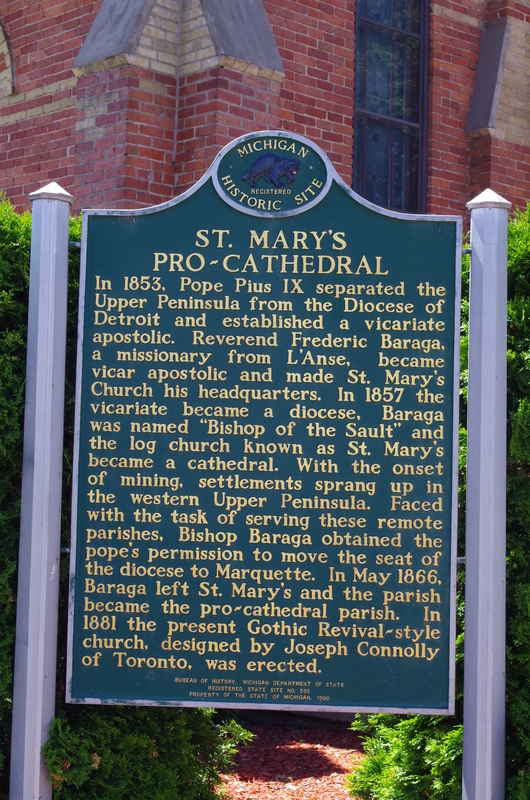 I read the sign and then later learned (from Wikipedia) that a pro-cathedral is a parish church that is temporarily serving as the cathedral or co-cathedral of a diocese. I learned something on that trip; yea! 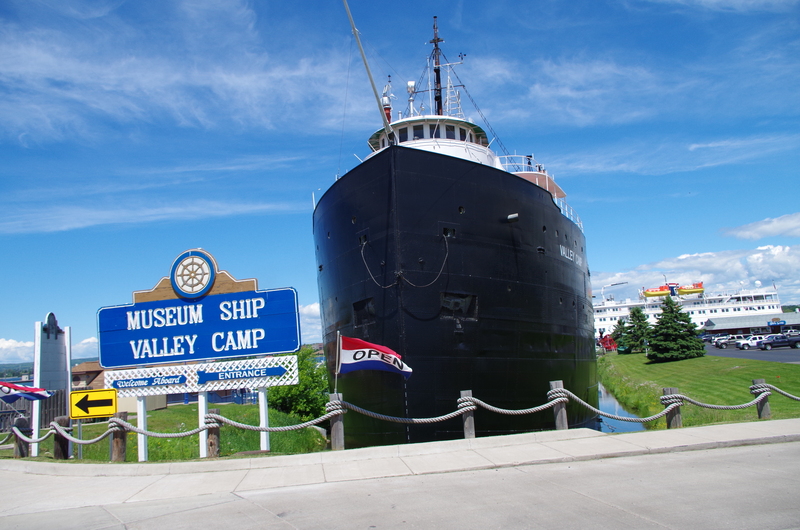 Our cruise ship docked next to the Valley Camp Ship Museum, and we were definitely dwarfed by the size of that ship! 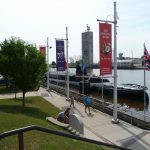 It is a huge freighter that now contains many artifacts and tales of history of the ships that have plied the waters of the Great Lakes. You can stroll inside as well as on the upper deck where your views of the canal will be enhanced. 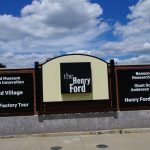 There’s plenty of free parking where you can even leave your car as you wander down historic Water Street, visit the various parks, maybe even the shops along Portage Avenue. 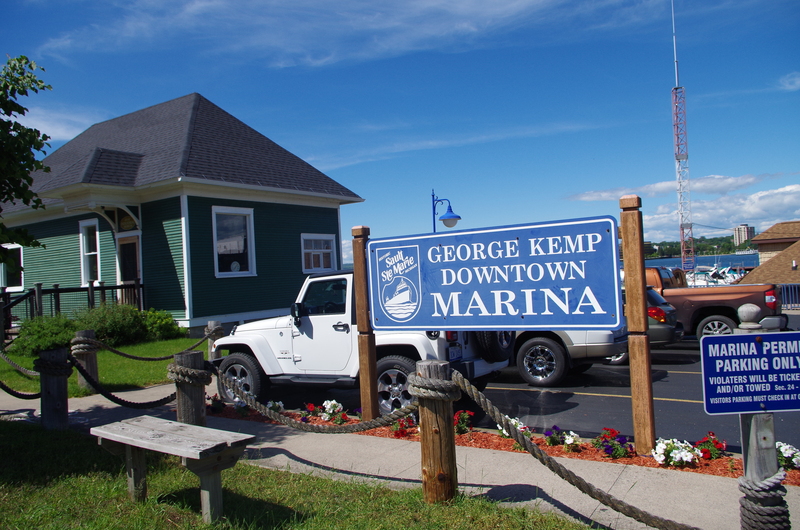 Right along the canal (very close to the Soo Locks) next to the Water Street Historic Block is the George Kemp Marina. 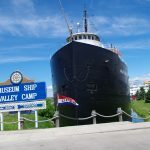 As you can tell from the photo, the parking lot is well-maintained, and its entrance is bordered by a beautiful historic home on the left and the Valley Camp Ship Museum on the right. 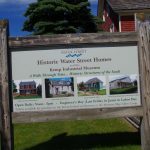 Strolling down the street, I came upon the Water Street Historic Block. 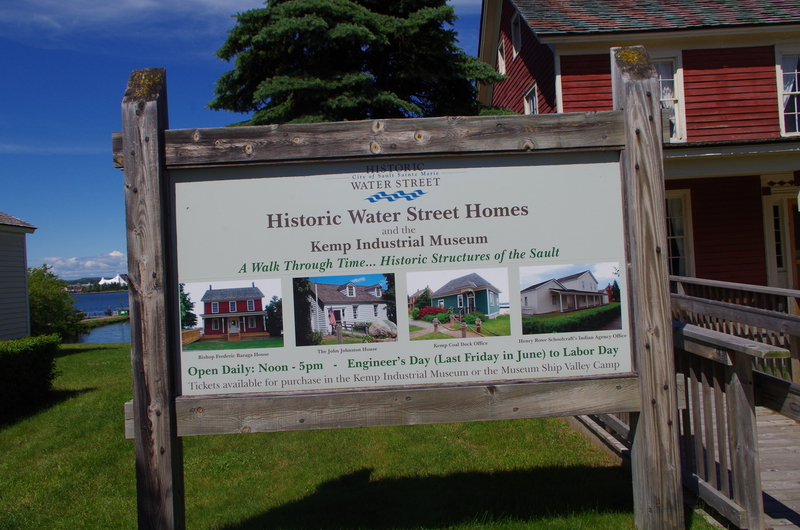 There are many old houses and buildings that were instrumental to the development of this area near the Soo Locks. 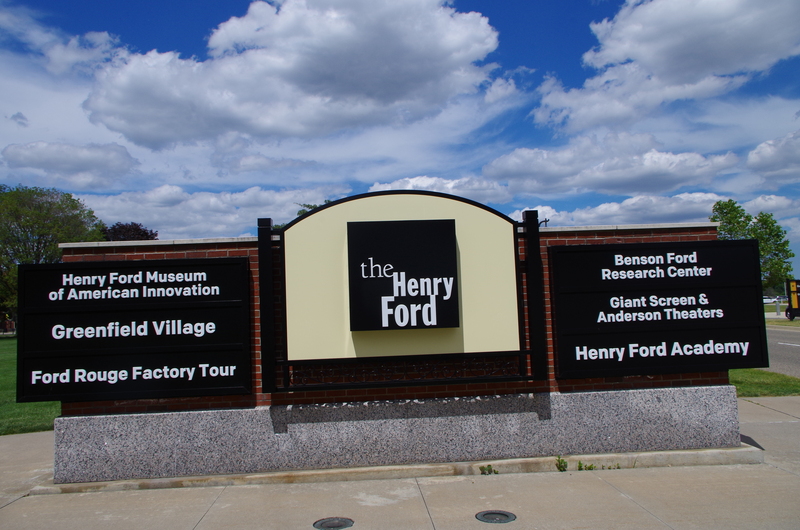 Signs outside describe the significance of the buildings, and some of them are open to the public. 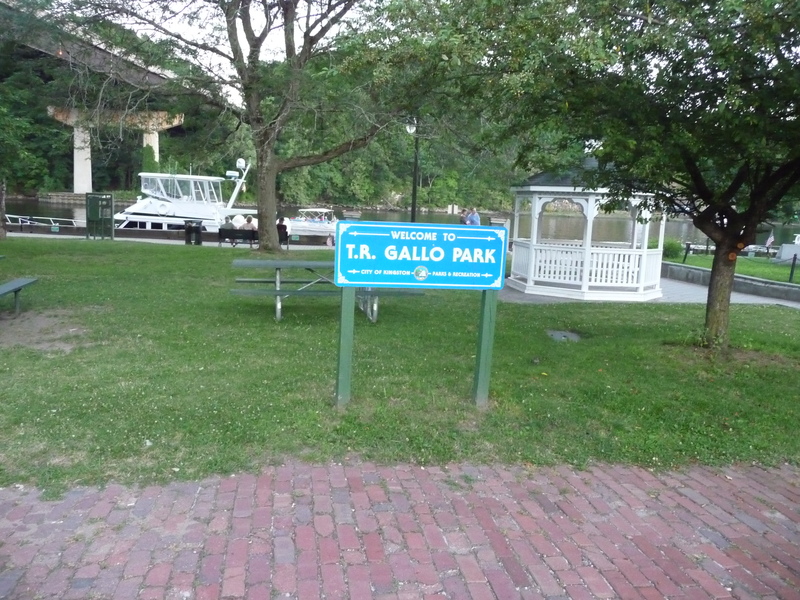 There are also several parks where you can enjoy the beautiful scenery along the canal. Not really about “history,” the Tower of History is a tall tower (looks like the tallest in the area) that’s really more of an observation tower. True, the views from the top can be spectacular, but I didn’t feel the it was worth paying an admission fee just to see a view of the river and locks from above. Our cruise ship went through the Soo Locks on our way from Lake Huron to Lake Superior. 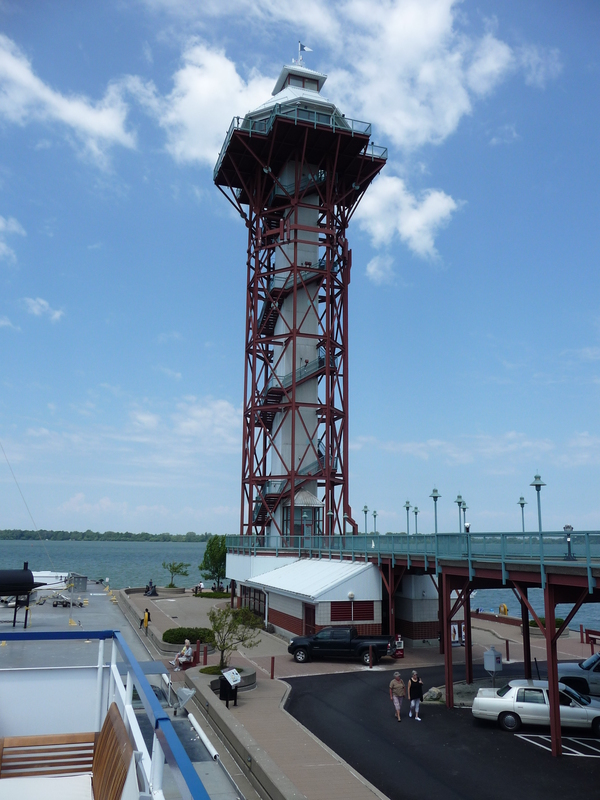 As we went north-west into Lake Superior, we saw people in a viewing center right adjacent to the locks. On our way back out of Lake Superior, we stopped in Sault Ste. 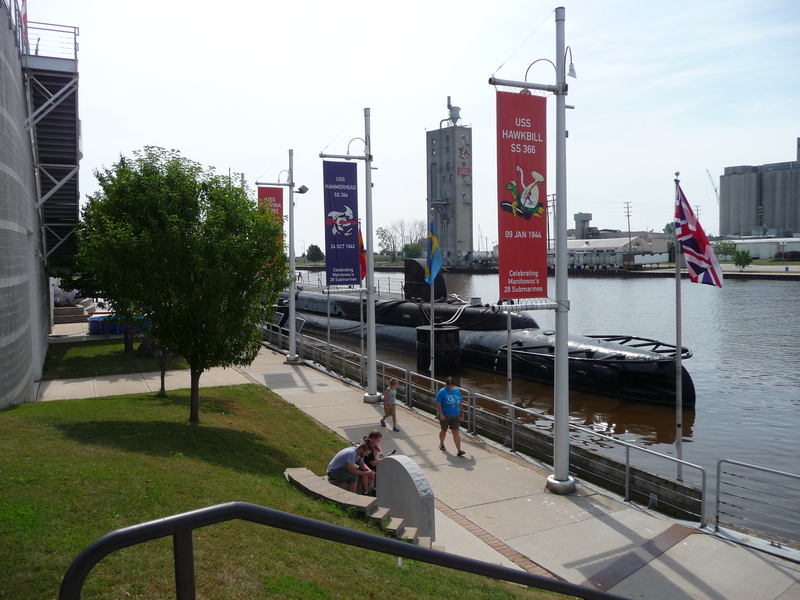 Marie and had a chance to go to the visitor center and see the ships go through from a different viewpoint. We were the observers this time rather than the observed. Our cruise ship docked in Windsor for our tours in Detroit. 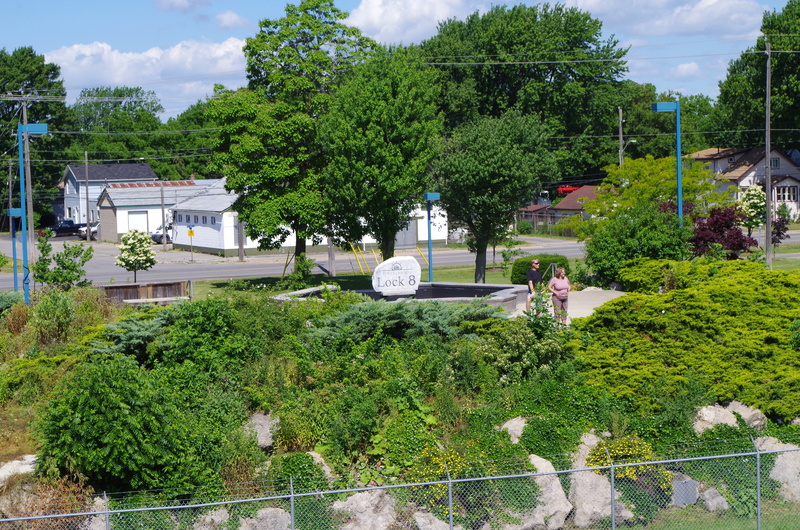 The riverfront area contains many beautiful parks and walkways, plus you’re able to watch boats (large and small) as they head north to Lake Huron or south to Lake Erie. There are also restaurants and bars nearby for food and drink. 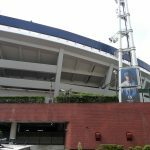 We saw some young adults playing soccer in the grassy areas. Our cruise ship was docked on the Windsor, Ontario side of the river, and so we had to go through the tunnel twice for our visits to Detroit. The tunnel is clean and light — the only real issue is that you have to stop and go through Customs each time you’re entering the USA side and then on the Canada side. Our cruise group had a few hours at the DIA, and we wished we’d had more time. There’s so much to see, including works by van Gogh, Gauguin, Picasso, many others. Their main claim to fame is Rivera Court where huge murals by Diego Rivera (Frida Khalo’s husband) adorn the walls and tell amazing stories. 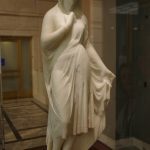 One set of sculptures that truly amazed me were by Giovanni Maria Benzoni where you swear you can see through the thin marble veils. I’ve never seen anything like that before. 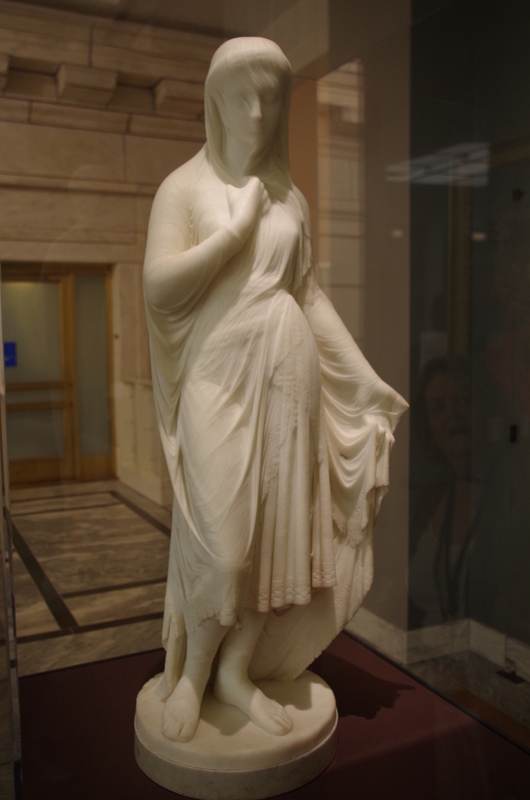 The photograph is one of several of the Benzoni sculptures that I took. 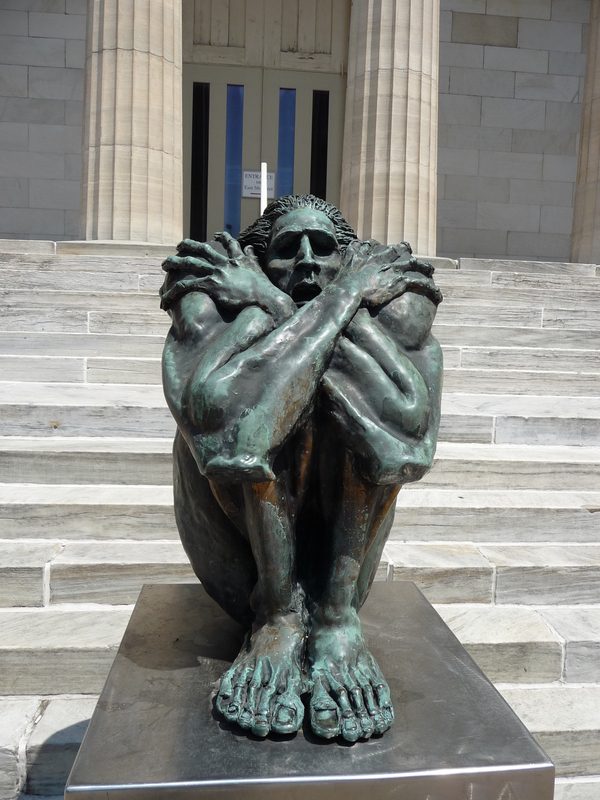 Going to Detroit requires a visit to the Detroit Institute of Arts. 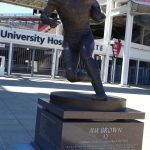 The home to the [new] Cleveland Browns, FirstEnergy Stadium is very attractive. It’s not open to the general public when there isn’t a game, but you can see through the gates in several areas to see the orange seats and green field. 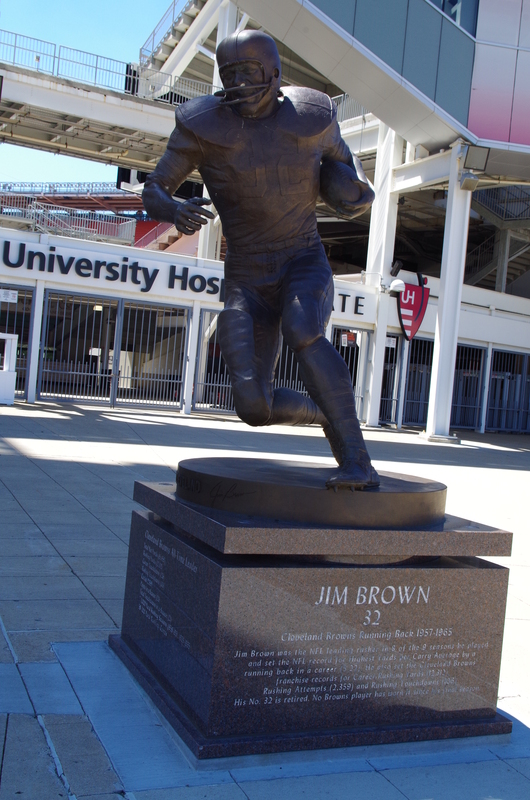 Standing outside toward the Science Center is a tall statue of the great Jim Brown. You can read some of his stats that are still amazing today. Dave was our driver and guide on our tour of Cleveland. His descriptions were great, and his voice was always uplifting and positive — telling people about Cleveland was clearly a passion of his, not a job. He picked us up at our cruise ship and dropped us off at the ship after our tour was over. The wooden seat backs are a bit uncomfortable as you go over bumps in the road. 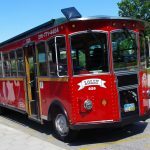 The small size (holds about 25) enables a more intimate grouping — this is a recommended way to tour the city! 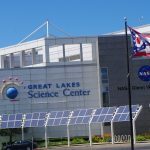 The Great Lakes Science Center is located right on Lake Erie within a couple hundred yards of the Rock & Roll Hall of Fame and FirstEnergy Stadium, home of the Cleveland Browns. 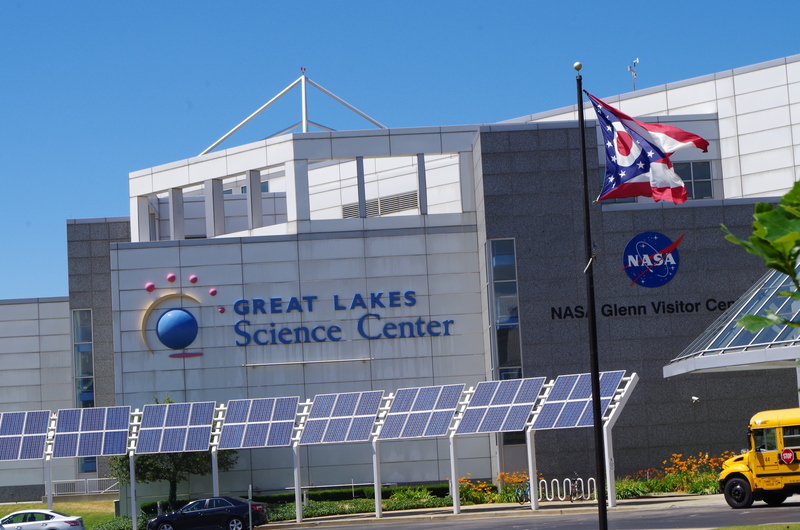 It would be easy to take in both the Science Center and the Hall of Fame in one day. 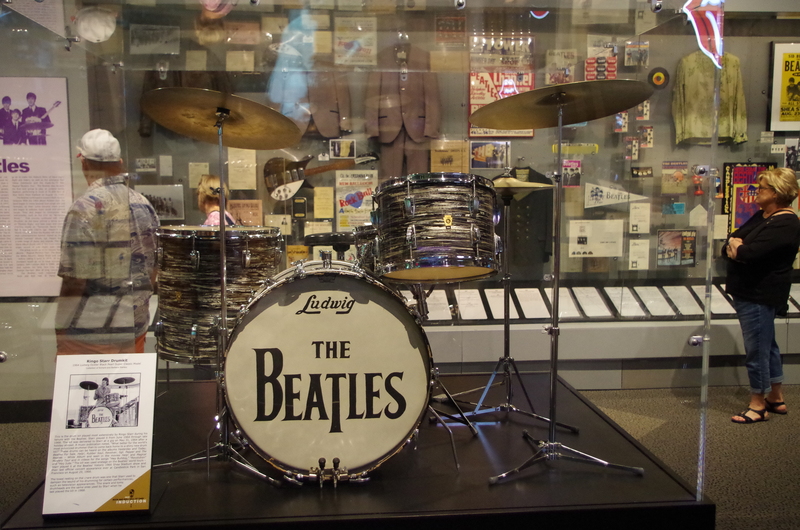 The exhibits inside are very nice, including the ones geared for young children. On a hot day, or on a rainy day, this would be an especially nice place to visit. Our cruise ship was docked about a half mile from the Hall of Fame, so we naturally went there. The admission prices is steep ($23.50) and there was no discount with my Press Card. 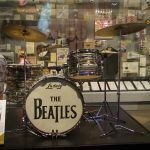 I spent most of my time in the lower level, enjoying the Beatles exhibit as well as many of the outfits worn by rockers.The gift shop has lots of music for sale, including CDs and LPs. 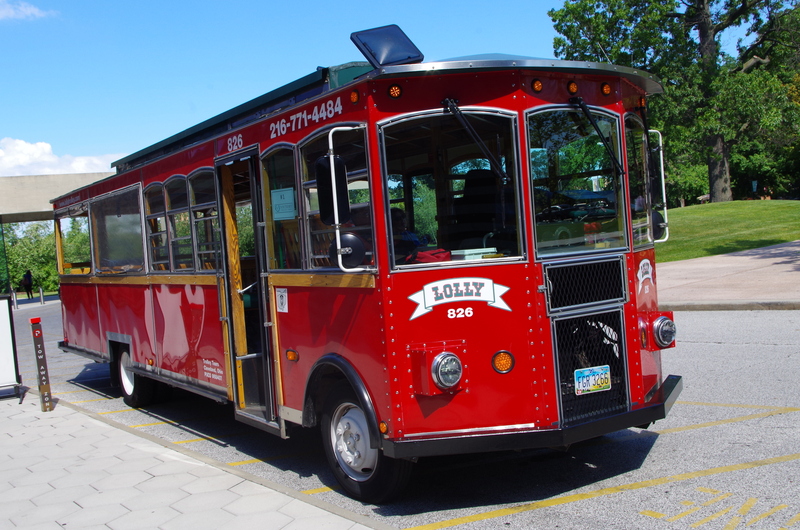 The bus outside is the touring bus used by Johnny Cash; it has over two million miles on it! Our ship’s tour went to Lake View Cemetery primarily to visit the Wade Chapel. We did learn a few interesting facts. 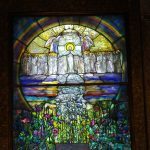 Our cruise ship tour visited Wade Chapel in Lake View Cemetery, and we were amazed. 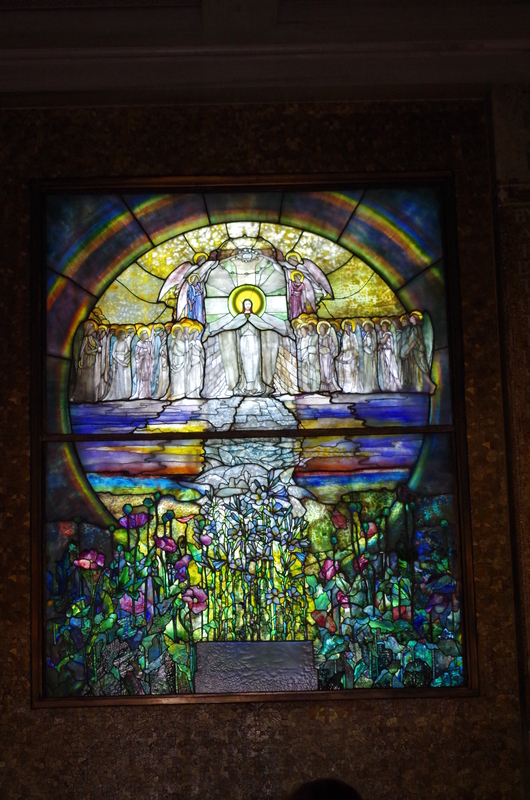 The building was built out of Vermont granite, and the interior — including the rose window — were created by Louis Comfort Tiffany studios (yes, thatTiffany). 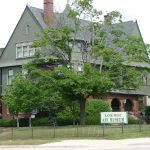 Listed on the National Register of Historic Places, the chapel was built to honor Jeptha Wade, the founder of the Western Union Telegraph Company and the first president of the Lake View Cemetery Association. 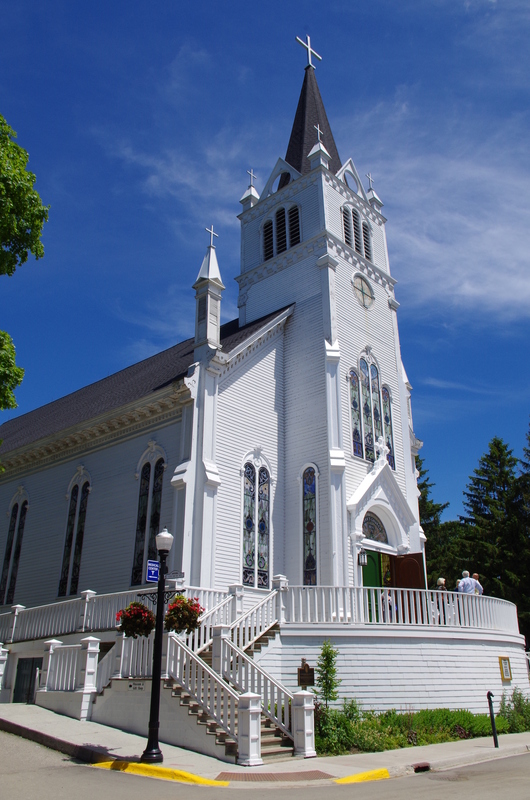 The chapel is still used today for funerals and also for weddings (yes, for weddings!). The mosaics on the sides of the chapel depict various scenes from the Old Testament and the New Testament. The docent was very helpful and told us all the pertinent information. Our cruise ship tour made a short stop at the Museum (mostly to use the free restrooms), and it certainly wasn’t enough time for us to truly enjoy the art. 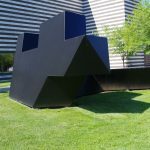 The outdoor sculpture garden was interesting, and it would have been nice to have had enough time to stroll through all the galleries. I was able to go through one Modern Prints gallery, but that certainly wasn’t enough! 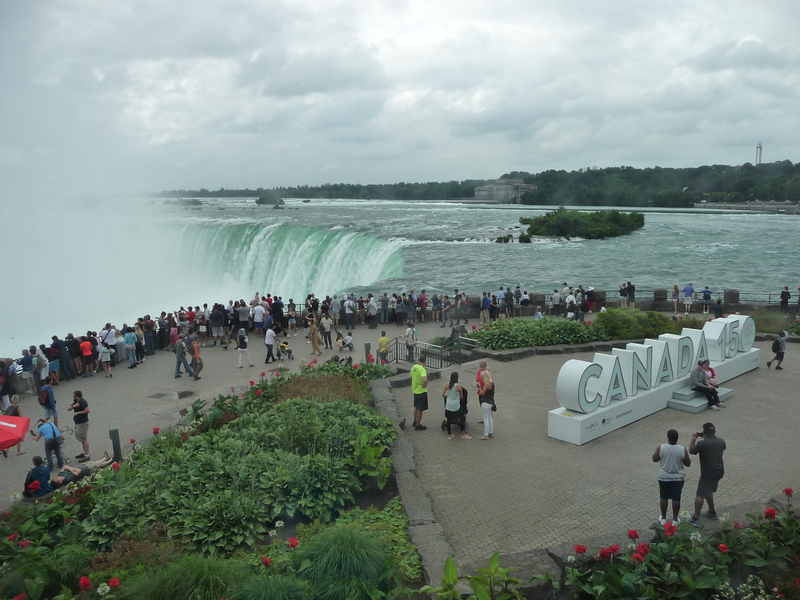 Taking a Hornblower cruise is probably the best way to view the falls from the water. Each guest is given a poncho to wear, although it’s of minimal use if you stand at the edge — you WILL get soaked. The staff are friendly, and the boats are clean. 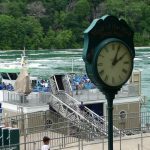 If you go to the Falls, you should also take a Hornblower cruise because the view from the lower level is more spectacular than the great views from the top of the falls. Viewing Horseshoe Falls is an amazing experience. Seeing the curved nature and hearing the water roar down is totally breathtaking. If you have the time, view the Falls from the top and then from a boat on the water! 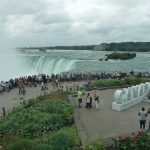 I’ve been to Niagara Falls (and on both sides) several times, and it’s worth going there each time! 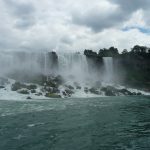 This time was with a group from our cruise ship, and we went on the Hornblower for our up close (and wet) view of the falls. The provided poncho is of little use if you get too close to the major water coming down. I stayed inside with my cameras and enjoyed watching others get soaked. p.s. the best view is on the Canadian side! 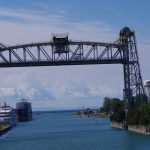 Bridge #13 on the Welland Canal is a lift bridge that goes up to allow ships to pass through. 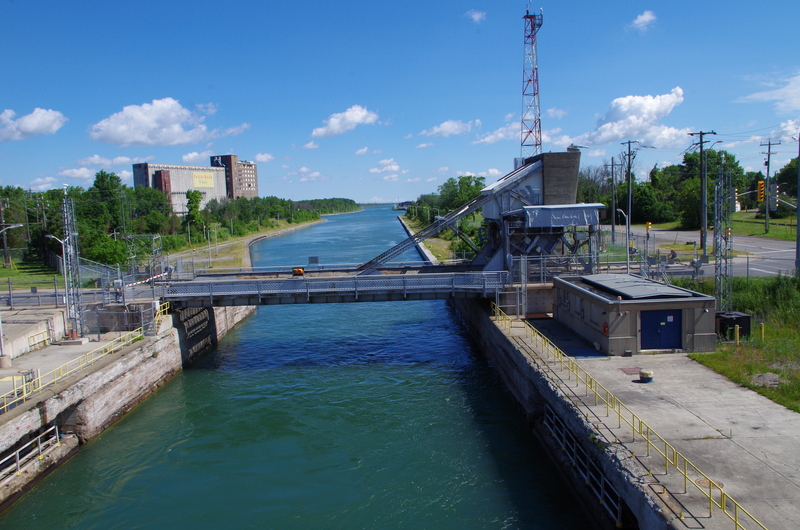 It was our final “obstacle” as we were exiting the Welland Canal into Lake Erie. Some ships tie upon the Lake Erie side of the canal as you can see in the photograph. Some are there for loading (or unloading), and others are waiting their turn to enter the canal. 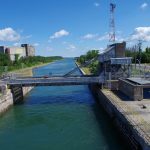 Cruising through the Welland Canal from Lake Ontario to Lake Erie was a nice adventure on our recent cruise of the 5 Great Lakes. There were parts where it was easy to forget that you were in a canal as it seemed like a river. Lock #8 was certainly the most interesting with the park on the side (see it’s separate review below). 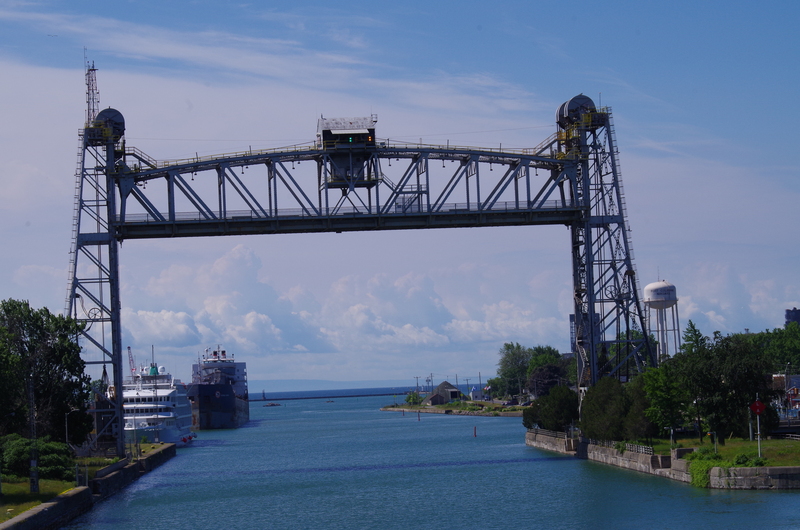 Our cruise ship was going through the Welland Canal to Port Colborne when we came into Lock #8. 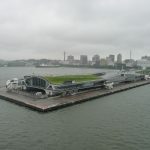 The park on the starboard side of the ship was very pretty with well-manicured grass and flowers. There were a few people who were enjoying the park as well as some watching us go through. This was a way to give a very favorable impression of the area. 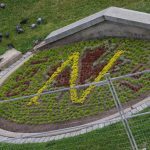 We drove by the floral clock on our way from Niagara-on-the-Lake to Niagara Falls. It would have been nice if the bus driver had stopped so we could have gotten nice pictures of the clock, but those of us on the right side of the bus had to quickly snap a photo. The clock is interesting, but clearly lacking imagination in the use of color (colour). This main area of Niagara-on-the-Lake is clearly designed for tourists. 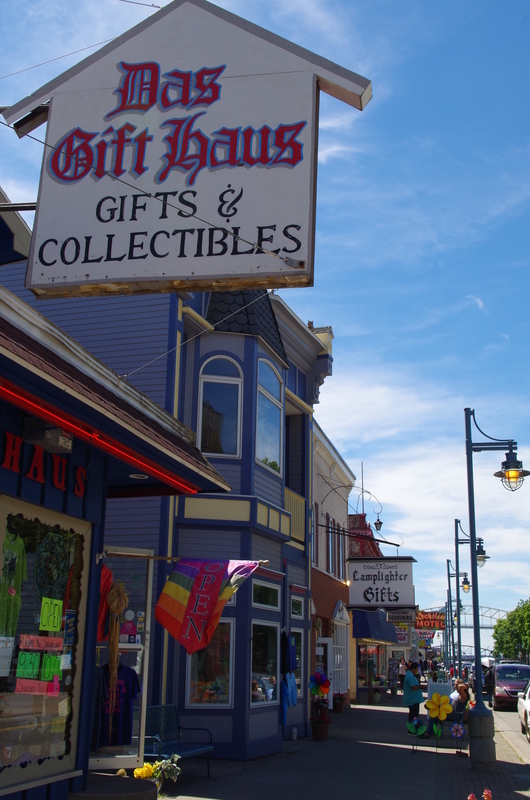 But it’s still quite a cute, charming district with lots of restaurants, coffee shops, knick-knack and souvenir shops. The flowers in late Spring to early Summer are very pretty, and it’s a nice walk on a beautiful day. I found the shopkeepers to be very friendly and nice; I think it’s worth a short stop here. 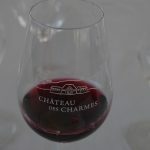 Our group of about 85 from the small cruise ship went to Château des Charmes as part of our day trip into Niagara Falls. We were split up into 3 smaller groups and then taken on a short tour of the winery. Following the tour, we were served a scrumptious buffet lunch along with wine tasting. 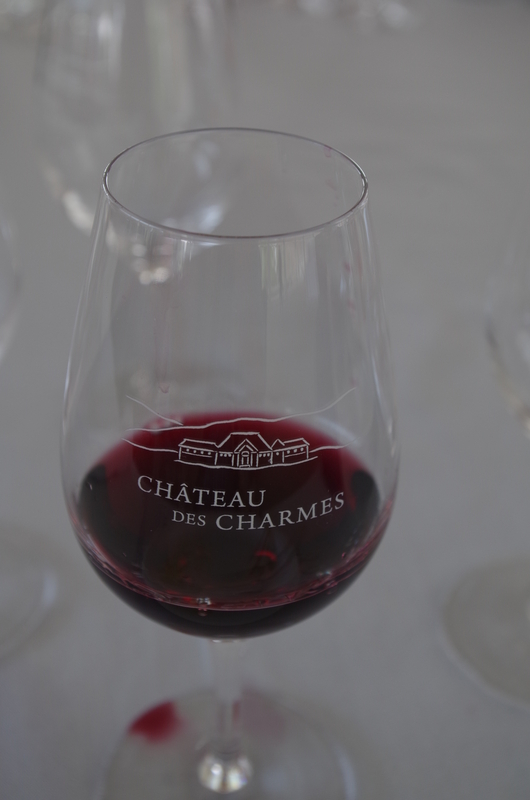 Overall, the trip to Château des Charmes was a great delight, and all the staff were quite friendly and knowledgeable. I have a lot more reviews to be added! More reviews on the way!